HOWLINGMIST: Nine Days on the Cape Wrath Trail...A Variation. 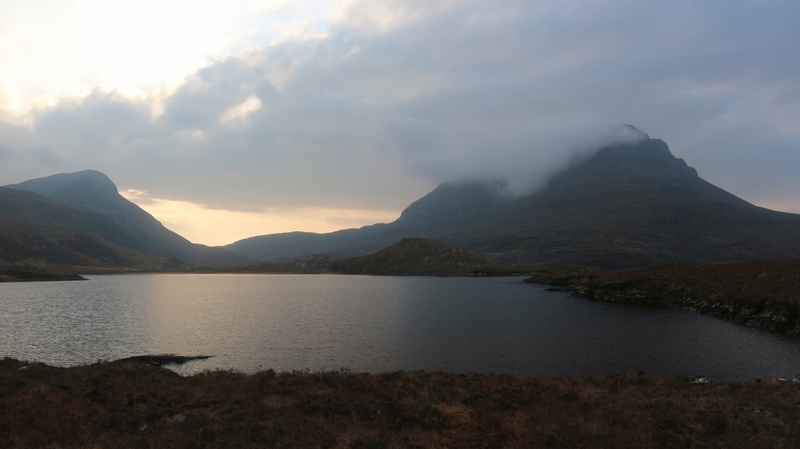 Nine Days on the Cape Wrath Trail...A Variation. 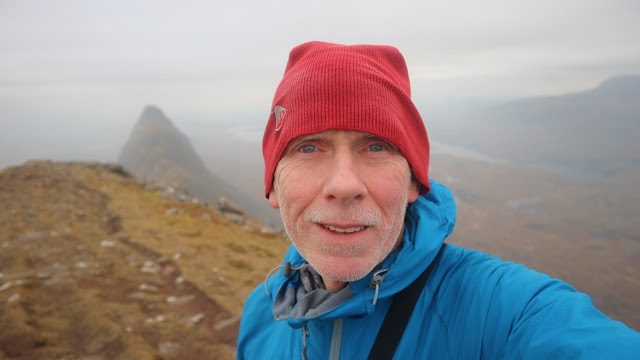 With Winter having suddenly disappeared from the Scottish mountains and the much looked forward to chance to climb with Craig and Patrick no longer possible I found myself with a quandary...what to do??. Well it wasn't too much of a brain buster and ultimately the decision was easy..I would return to the Cape Wrath Trail. 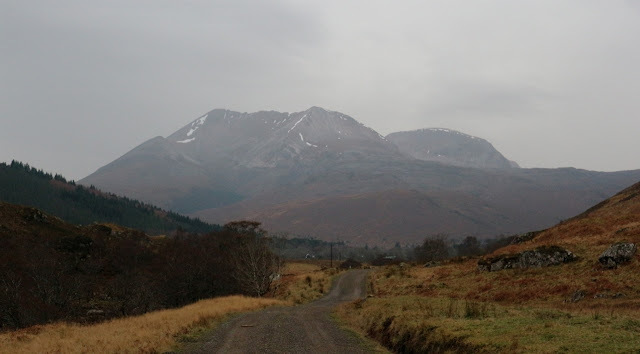 ...https://howlingmist.blogspot.com/2017/04/strathcarron-to-glenfinnan-taste-of.html . It was a superb experience and I was keen to explore further this fabulous trail.This time I was heading north. 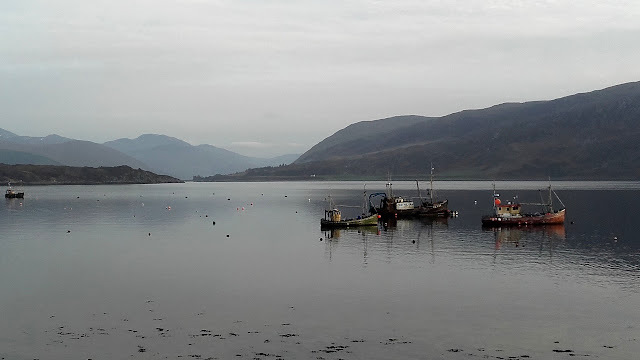 I did my usual train..ferry...train×4 and finally reached Strathcarron at 19.55 Saturday evening. 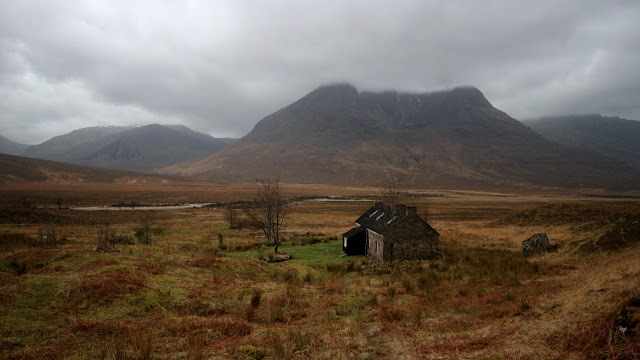 The weather all the way had been excellent until I passed Garve when rain started to hit the windows of the train. 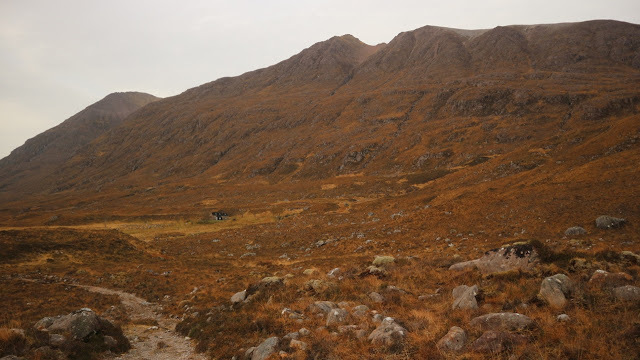 My plan was to reach the bothy at Coire Fionnaraich that night so it was disappointing to have to face a two hour trek in the rain as well as the dark. Ah well it couldn't be helped. 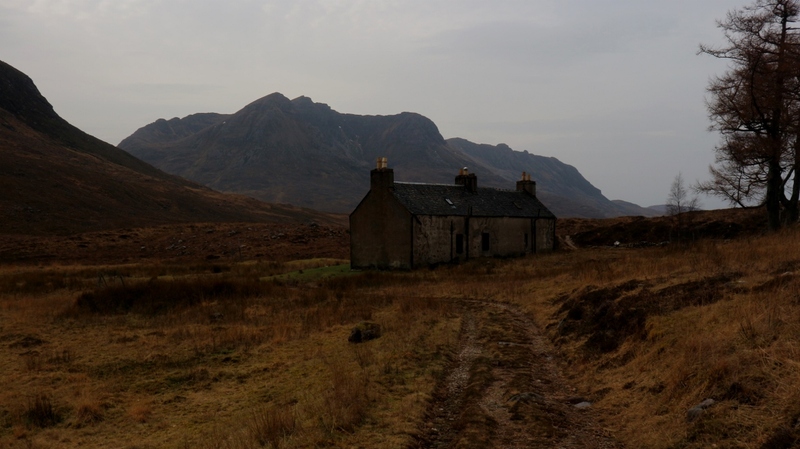 I was a little apprehensive about reaching the bothy but there seemed to be a good track all the way so I was hopeful my penchant for losing trails wouldn't surface tonight. It was pitch dark, windy and raining lightly as I left the train so I fully suited up and after a final check on the map I was off. Several hundred metres on the road before I crossed over the river and found the trail. It was a delight as it ran alongside the river and was nice easy going. The rain had stopped and I could see stars above. It felt great to be finally on the move. My torch caught two deer as they bounded across the path just ahead. I think just emphasised the fact that I was entering wilder country. The track was supposed to go directly to a place called Coulags where I would cross a road and climbed to the bothy. Instead I reached the road about a kilometre before there but again after checking the map I found the correct place okay. The trail rose gently along an estate road initially before becoming a well made mountain path that was easy to follow. I reached the footbridge and crossed the river and I knew I was nearing the bothy. Shortly after that I saw candlelight in two windows up ahead and it beckoned me on. I entered the room right of the front door at 22.00 It had been a two hour walk and I felt I was after making the most of the limited options for today. There was a couple already there and more asleep upstairs and in the other downstairs room. The couple were heading to bed themselves so I had the room to myself almost immediately. 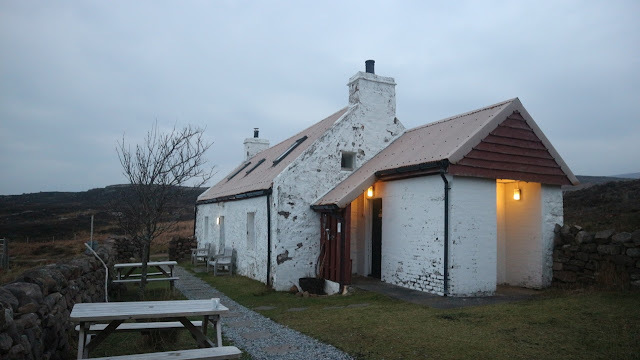 The place was clean and in fine condition and the multi fuel stove was glowing with a fine coal fire. What a treat. I slept very well. People started stirring at 7 am so I started packing up my stuff so as to allow room for the others. I could have done with some more sleep but I had a big day in front of me so it was best to be off early. 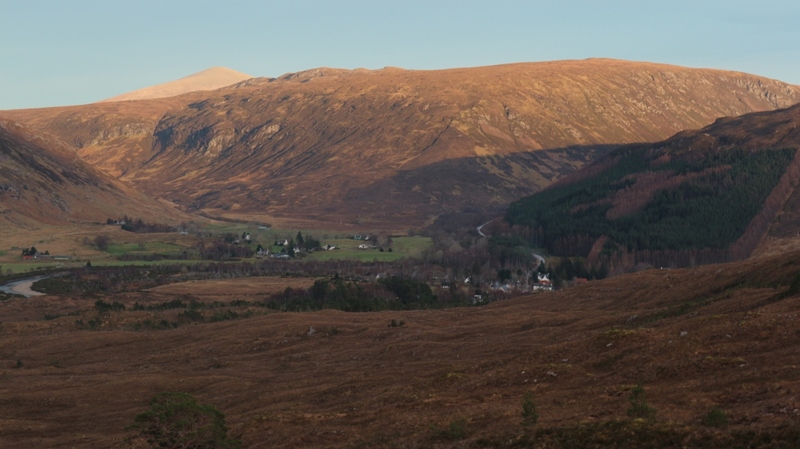 It was a glorious morning and clear skies and little breeze greeting me when I left the bothy. I got a bit of a shock when I tried to use my camera and fount it was dead. I changed the battery but to no effect. Damm and bugger. It seemed that it would be down to the phone to capture any pictures. I tried again a few minutes into the hike and after a few "gentle" taps with my hand the camera sprung to life 😊. The walking is easy on a good track at it rises towards Bealach Ban. 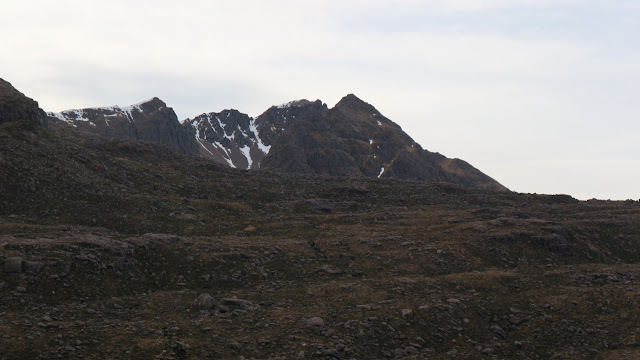 Sgorr Ruadh (962 metres) rose on the right hand side but my eye was drawn more and more to Maol Chean-Dearg (933 metres) whose northern flanks were an elegant delight. 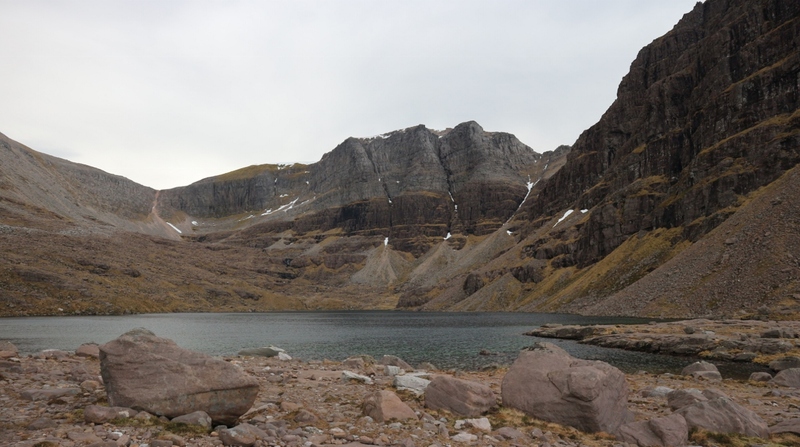 After passing the mirror like Loch Coire Fionnaraich the trail turns right (east) and a rising traverse sees you reach the bealach. 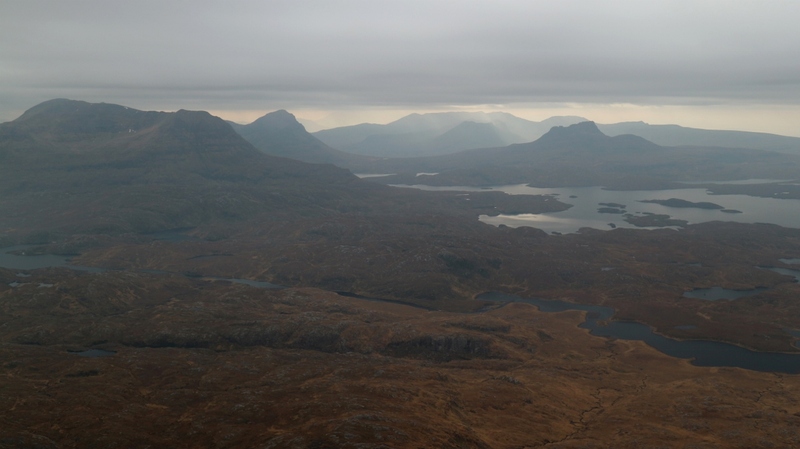 Up here at 550 metres there was a distinct chill and a stiff breeze so I didn't linger as I was anxious anyway to see the glories of Liathach and Beinn Eighe which lay ahead. Cresting the pass didn't disappoint and the fine wall of mountain architecture was suddenly revealed. 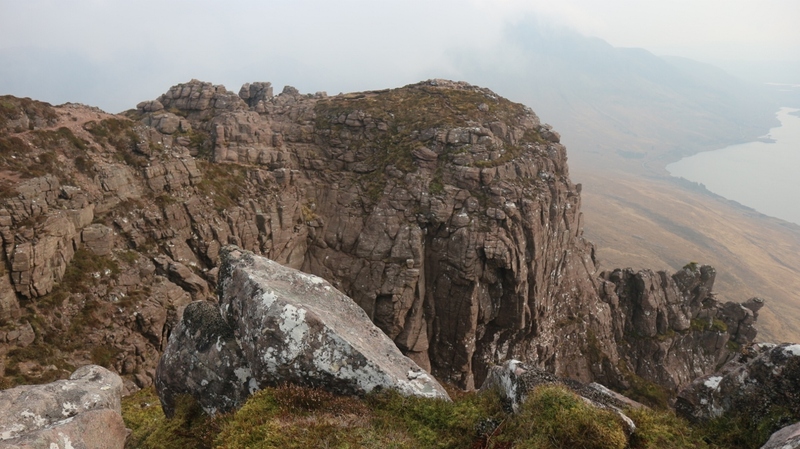 At first glance it looks like one impenetrable wall but but closer inspection shows the gap that rises into Coire Dubh Mor. 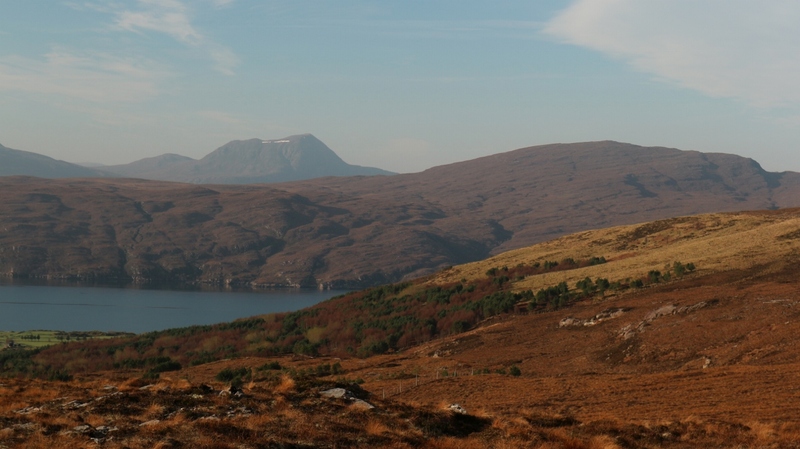 First off though I had to reach the road that crosses through Glen Torridon some six kilometres ahead. Then we enjoyed pristine winter conditions and that trip confirmed my love for this most stunning of places. Today things were snow free and the temperatures were in double digits. 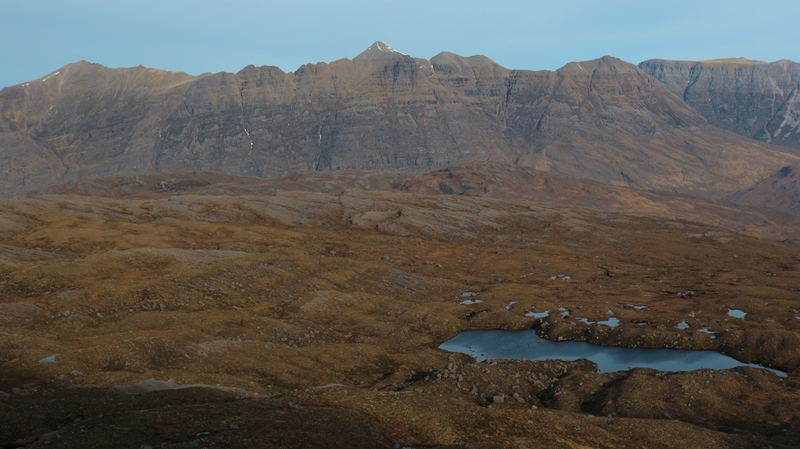 Despite this the cliffs and coums of Liathach were still a spectacular delight and I paused often to look and soak it all in. Not that that was the only attraction. 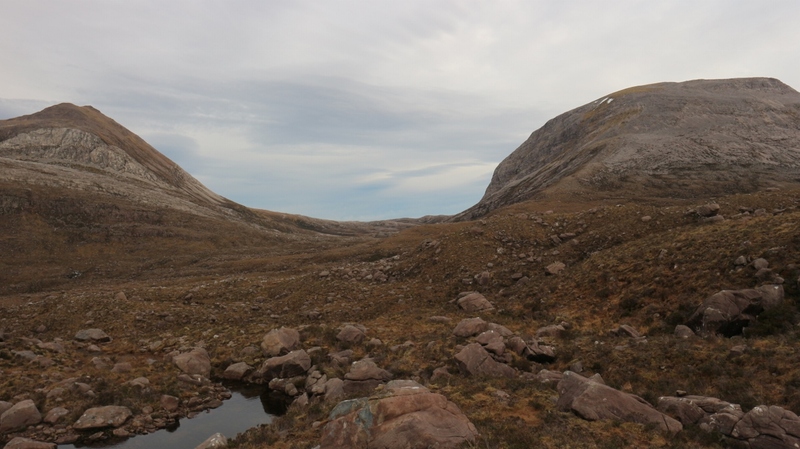 As I got in further into the coire the glories of Beinn Dearg, Beinn Alligin, Beinn a'Chearchaill and others rose like solitary Titans from the vast wasteland of Wester Ross that stretches for miles and miles to Poolewe. 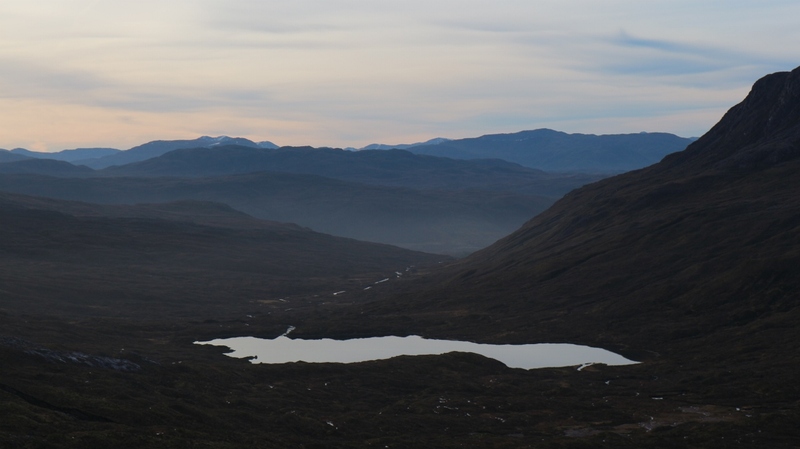 An eagle soared by Beinn Dearg and it just completed the picture of wonderful wildness. I followed the trail as it rose around the flanks of Sáil Mhór and climbed all the way to the lake where I could get a view of the Triple Buttress of Beinn Eighe. This added a couple of hundred metres to the climb but I reckoned it was worth it and I thought I could traverse from there around the flanks of Ruadh-stac Mór and so rejoin my route. I was wrong. After traversing for almost a kilometre it became quite clear that I was heading into steep ground so I traversed back and down to about the 400 metre contour from where I was able to more easily progress. Not that progress was easy after that. 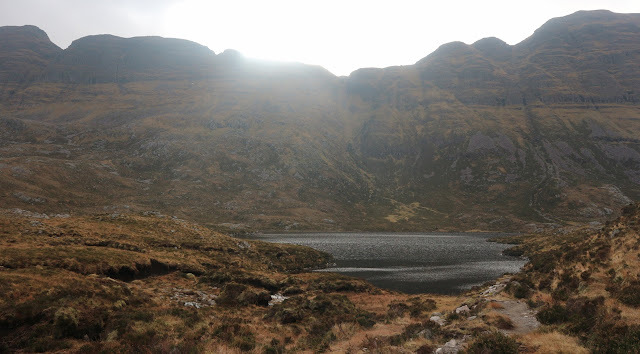 Now the recommended wisdom is to stay up at the 400 metre contour while travelling here but this would mean a longer journey into the valley between Ruadh stac Mór and Ruadh stac Beag. I tried but I guess I was sucked down too low and several torturous kilometres followed as I went up and down little ridges, around and back peat hags and crossed and re-crossed drains and rivers. It was exhausting, especially on the first full day while I was hauling nearly five days of food. 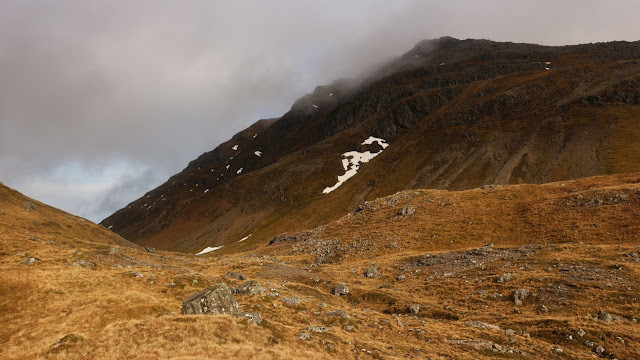 Eventually I reached the pass between Creag Dubh and Meall a'Ghuithais and I found the track (yes a track, yippee) that led to Kinlochewe. 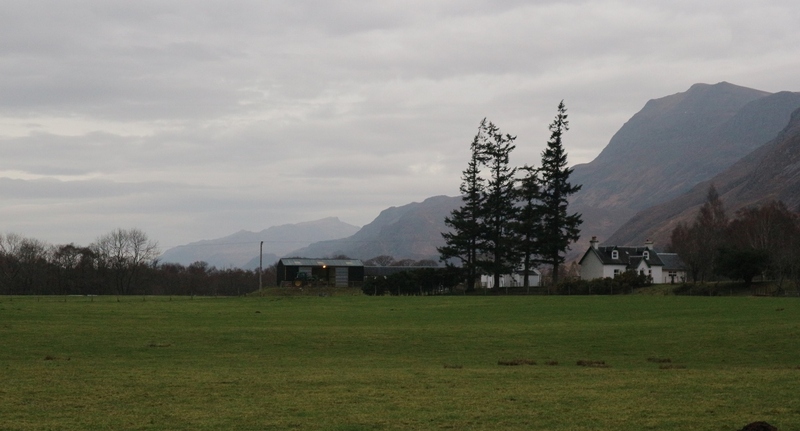 The descent was long on tired legs but eventually I reached the little village and it's hotel and bunkhouse at 17.20. Nearly 9.5 hours out on the first full day. 30 odd kilometres and 1000 metres of climbing meant I was a tired boy. I'm not sure I needed the few pints in the hotel bar to help me to sleep but they didn't hurt 😏. A good nights sleep did wonders for my recovery and I was eager to be off this morning. 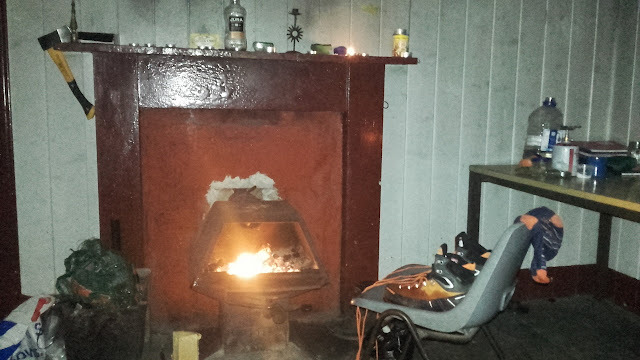 It was a real luxury to have had the bunkhouse to myself last night and I was able to relax a little in the morning so I didn't leave the village until 08.15. The dry weather of yesterday had changed and clouds leadened the sky. It was dry for the moment but rain was forecast to arrive early doors and last until around noon. 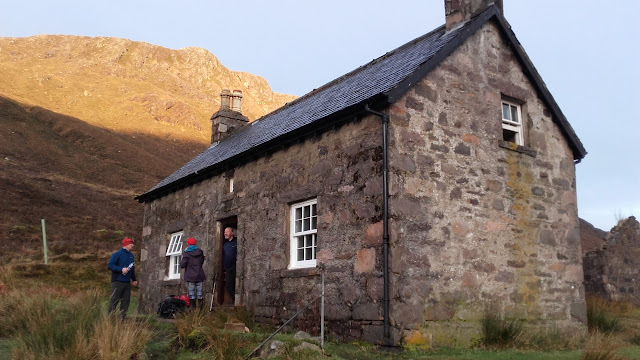 The destination for today was the Sheneval Bothy near An Teallach which was said to be an easier day than yesterday but was still about 28 kilometres long and had 700 metres of ascent. An estate road led towards the Heights of Kinlochewe which is something of a misnomer as the height gain is minimal until after five or so kilometres you reach some estate homes and you turn left (north) and start climbing into the steeper glen "Gleann na Muice". The rain had long since arrived but I had donned the rain gear and as it was so mild I was quite comfortable and enjoying myself. The view back to the northern abutment of Beinn Eighe while on the walk in was stunning even in this weather, but I was looking forward to vistas new. 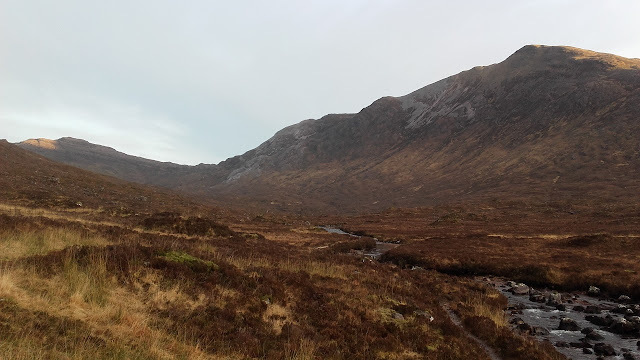 Eventually the road reached a small hydro development and thereafter a good trail left the confines of the glen and the landscape opened out and levelled off. Slioch made for a great sight to the left and ahead some of the Fisherfield munros soared but everything else paled in my eyes when compared to the beauty of Lochan Fada. Even in the grey misty weather (or because of it) I found the scene simply delightful and my spirits soared as I stood and soaked it all in. Now the trail is left behind and there is a 250 metre climb up across bog to the flatter ground above the rocky buttresses of Creag Ghlas Bheag. The weather was starting to play ball and the rain had stopped and patches of light (if not blue) sky were appearing. Up here at over 550 metres it had a real feel of being in the mountains and it was tempting to drop the bag and just keep going up. 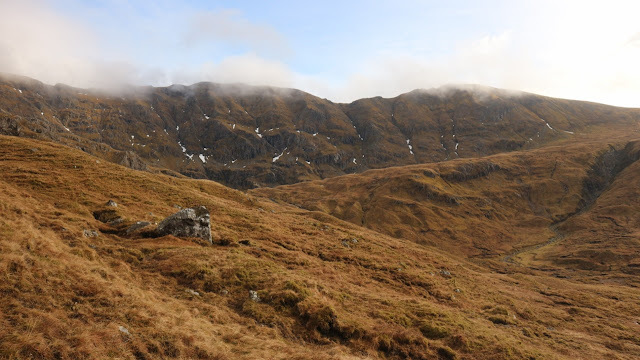 Sense prevailed and instead I made the easy descending traverse towards Bealach na Croise, A rough track appeared here and traversed around the slopes of Sgurr Bán well above the glen floor before eventually reaching the river near Loch an Nid. 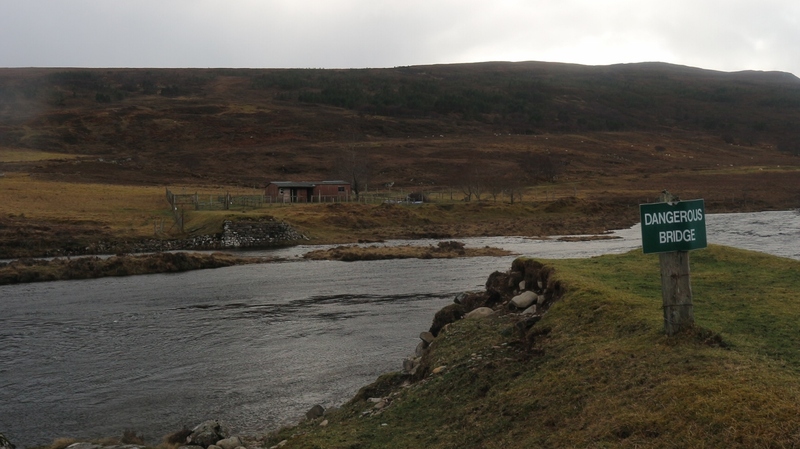 I had been hoping that a footbridge might emerge here but the river was low and easily crossed. The trail continued for a fair while on the right side of the river after passing the lake until you reached the wooded valley floor where some old ruins are found. 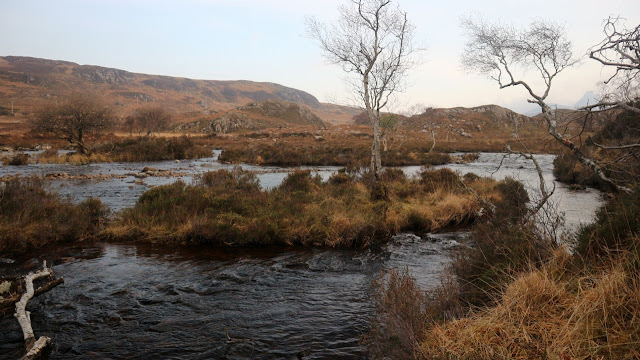 Good camping spots are to be found here and if you have the energy you could take the estate road to Dundonnell. I turned and followed the trail alongside the river for a further few kilometres and eventually reached the famous bothy Sheneval. I reached it at 15.45 and I was delighted to find I had it to myself. 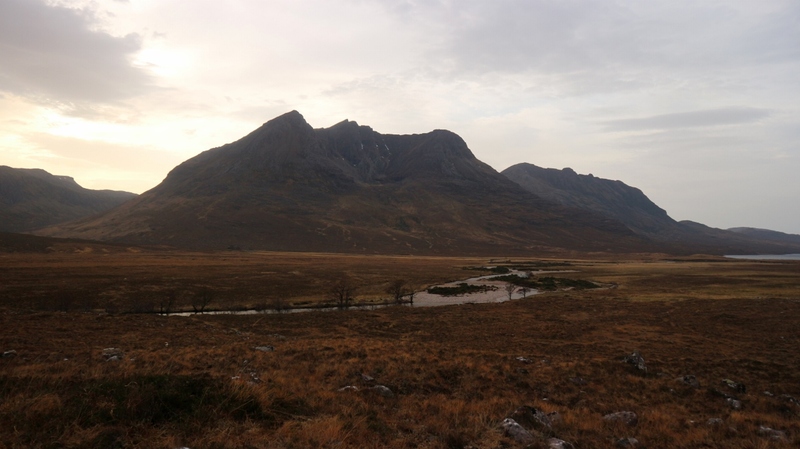 It is beautifully situated under the southern slopes of An Teallach and not far from Loch na Sealga, The munro Beinn a Chlaidheimh (914 mtrs) rose across the valley but for me it was the Corbett called Beinn Dearg Mór (906 mtrs) that was the eye candy and it looked to have the potential for some great winter climbs in its north facing coum. I watched an eagle glide across the valley and disappear behind the nearby crag and it was then I spotted some new arrivals. 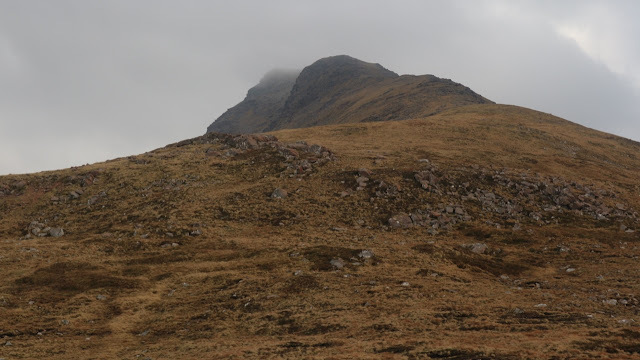 A triumvirate from Leeds had come to climb Beinn a Chlaidheimh the following morning. A very nice convivial evening followed and I went upstairs to bed at 21.30. I emerged into a dry mild breezy morning with clouds shrouding the tops. Today promised to be an easier and shorter day if I didn't walk the road to Ullapool. The route starts climbing right from the door and rises beside the stream before traversing the flanks of Sáil Liath. 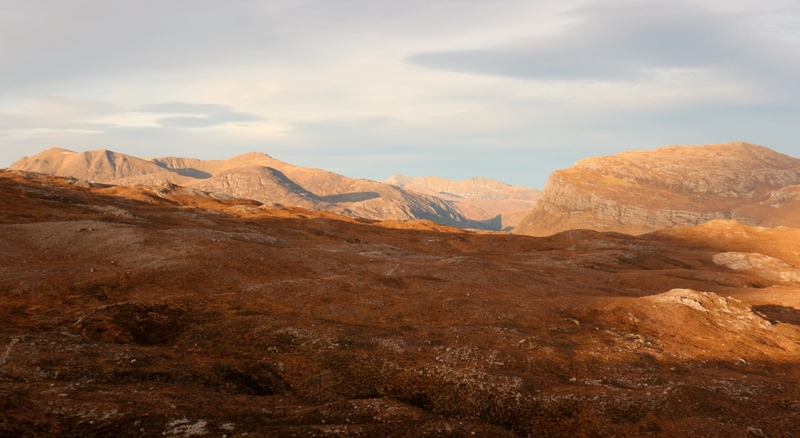 Around 300 metres are gained before you reach the crest of the expansive shoulder. I had been and perhaps stil was, toying with the idea of pitching my tent up here and travelling light do a traverse of the massif. It is without doubt one of the best outings in the UK, but I had always hoped that my first time on it would be in winter conditions and to be honest this morning, in the stiff breeze and with cloud shrouded summits it wasn't really that appealing so I decided to save it for better times. Decision made, I now looked forward to the rest of the day. I would now head as far as Inverael and from there make my way to Ullapool where a B&B would supply some welcome comforts. I met a guy coming towards me and he told me he was heading to join up with four of his mates who had spent last night in Sheneval as well. I must have slept better than I thought 😊. Anyway, the trail became a track and a very pleasant descent followed town to Dundonnell. 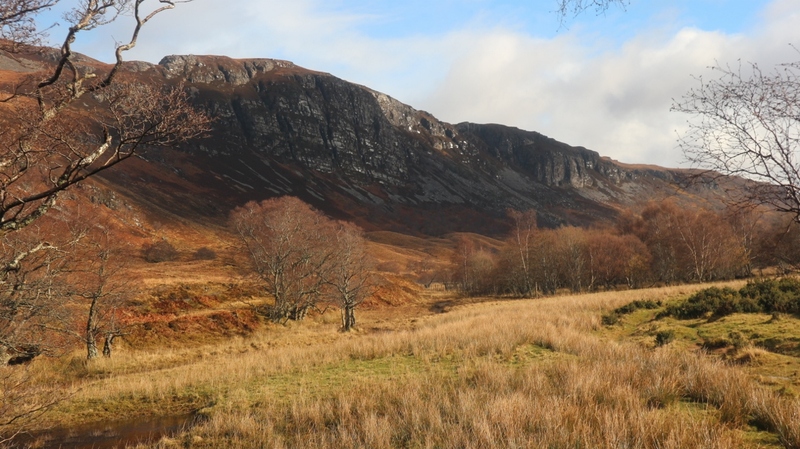 A short walk on the road and then I turned onto the lane to join the trail that headed for Inverael. I wasn't able to immediately find it so I just climbed directly up through the birch wood until I was out on open ground. Once there I was able to have a good look at the lie of the land and get my bearings and I was able to join the easy trail. This was lovely gentle open undulating ground that offered expansive views in all directions. 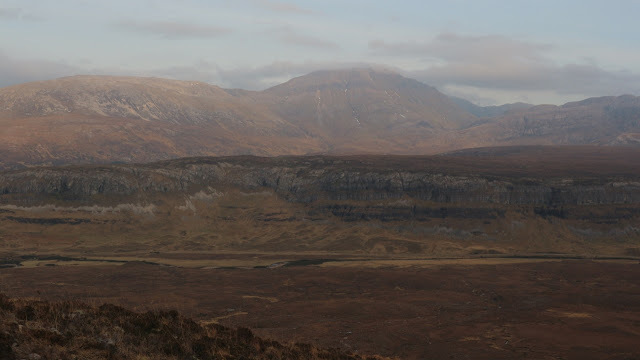 The day was actually after clearing up very nicely and all the mountains were now in the clear. This was a superb place to stop and look back at the glory of An Teallach. 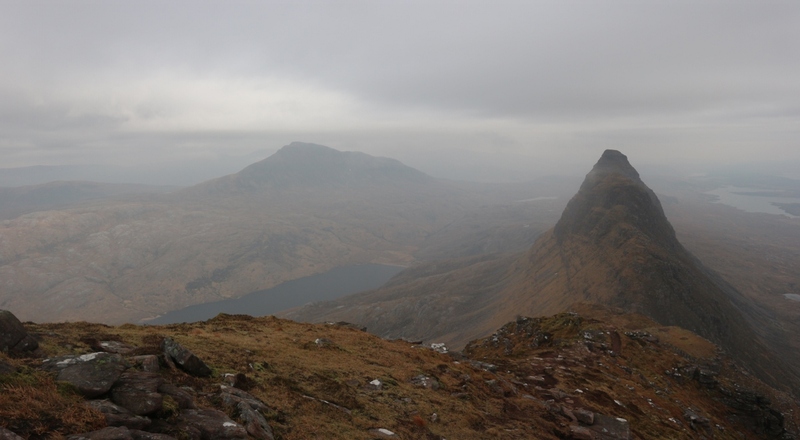 I must confess to having pangs of regret that I hadn't been a bit bolder and gong for the climb. Anyway the dye was cast now and I was determined to enjoy the rest of the day. 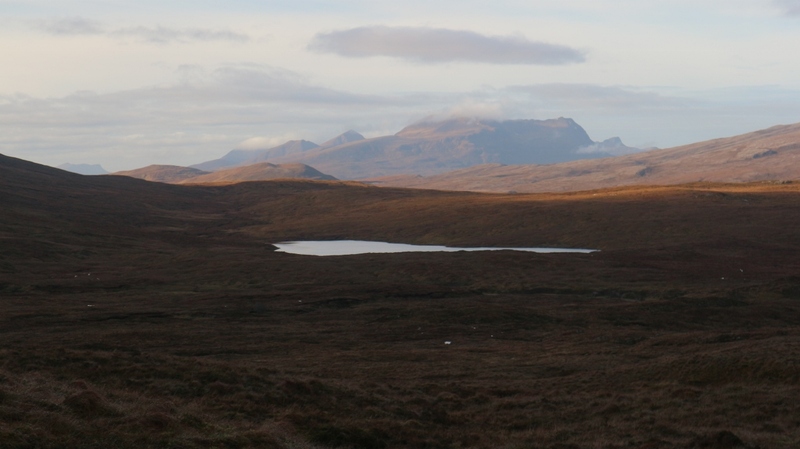 And that was an easy task as I crossed the rolling moorland with the impressive Beinn Dearg (yes there are quite a few of them around here 😏) framing the skyline ahead. The trail became a little wetter as it crossed the ground near Loch an Tiompán but then the descent arrived soon after and this was very pleasant in the sunshine. 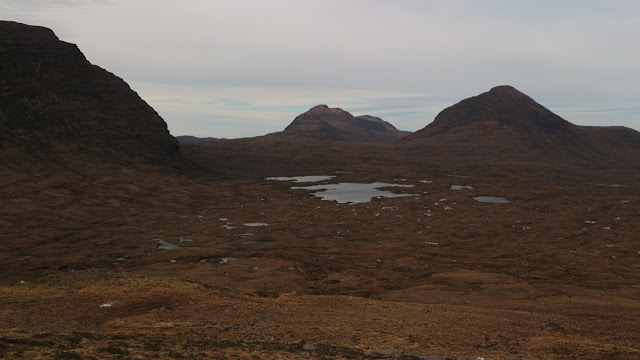 One thing that always strikes me is how little green is to be seen in the highlands. It has such a complete blanket of bog that when you do see some green farmland it stands out like a jewel. 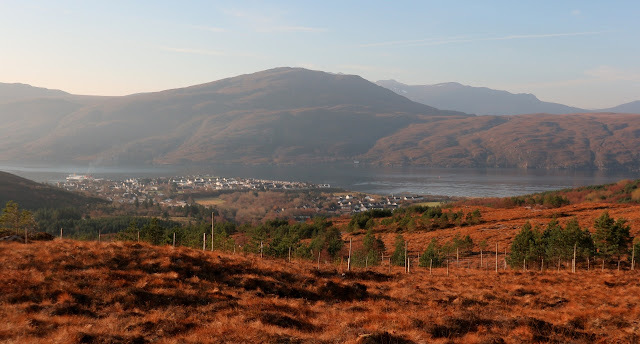 The farmland in the valley floor was a lovely and welcoming sight and I enjoyed my jaunt down a good track to reach it.While up high I had booked myself into the Riverside B&B in Ullapool (http://www.riversideullapool.com/) and I had told them I would arrive between 3 and 4 pm...well when I reached the road at 13.15 it really didn't appeal to walk the 8 miles on busy tarmac so I stuck out my thumb and I had a drive from a young lady about 30 seconds later. She deposited be outside the B&B just after half past. The owner was great and allowed me to check in straight away and the superb shower was put to very good use. 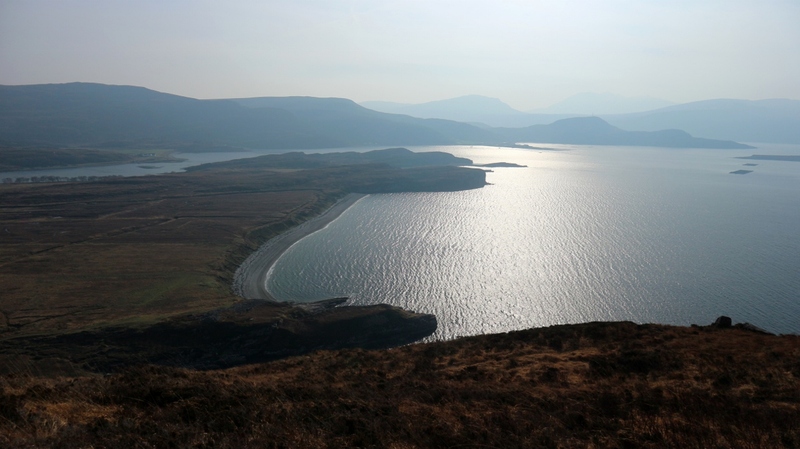 This left me plenty of time to relax and later explore Ullapool (lets face it it didn't take long. As the woman who gave me the lift said "it's all laid out in a grid, so it's a bit like New York but a bit less High Rise" 😃). She had also told me that the best fish and chips in town was at the small chippy nearer the ferry port and I can heartily recommend it. Excellent!.During the evening I was in contact with Patrick and we had formulated a plan to meet up at Loch an Doire Dhuibh on Thursday. The excesses of food and alcohol mustn't have been too bad as I felt quite good this morning. The good weather was set to continue for another few days and my bag was now loaded with six days food. The plan for the rest of the trip was to follow a route I came across online that went from Ullapool to Inchnadamph via Acheninver, Stac Pollaidh and Suilvan. 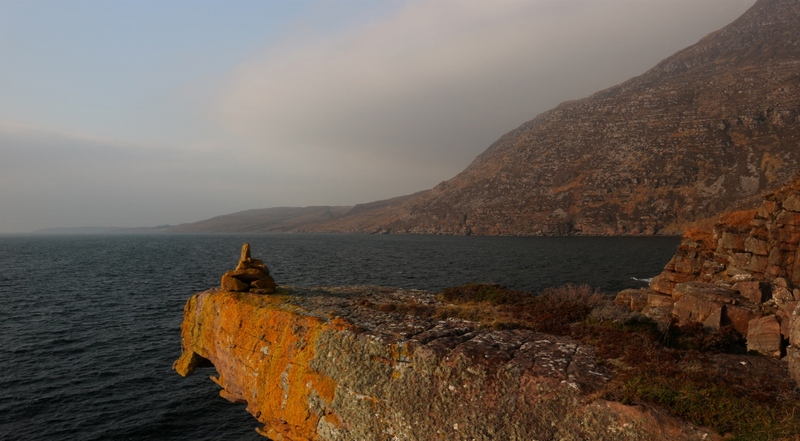 Thereafter I would return to Ullapool via Oykel Bridge. I was booked onto the sleeper train to Crewe on Monday night so hopefully I had plenty of time. I was really looking forward to getting immersed in the wildest of Assynth and visiting up close some of Scotlands most iconic mountains. It was a beautiful crisp clear morning as I left the busy little town and my spirits were high as I looked forward to the challenge/adventure ahead. The bag felt heavy but there was no big climb in the offing today. First up was the task of finding the trail that led to the open country. After crossing over the bridge the map suggests a trail just beyond the industrial estate and there was indeed a gate but things looked quite overgrown so I went further up the road to the bend and an entrance to the right led to a rough forest track that rose through the woods and eventually easily exited onto open ground. From there I went up to the shoulder of Beinn Guithais and just beyond that I reached a good track that led to the series of Hydro schemes and lakes. I then followed the road back down to the A835 and when it crossed the river I turned onto the little lane that headed west towards the coast. I should say a bit more about the last section.It had been a delight. Once onto the open hillside the ground had been rough and trackless until I joined the track to the lakes. The weather was quite warm (or maybe it was the weight of the bag) and I travelled in just a baselayer. 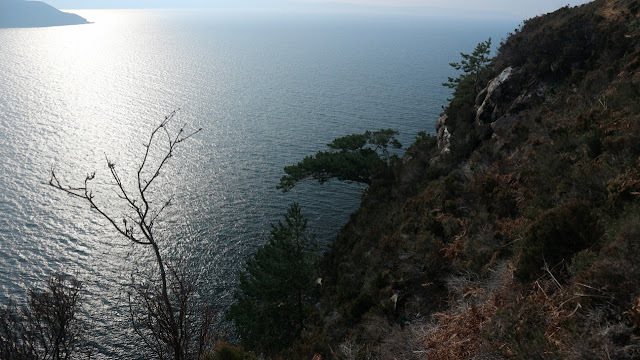 The views were great, a little hazy maybe.. but warmth, little breeze and sun while hiking in February ? ?, I wasn't going to complain 😃. 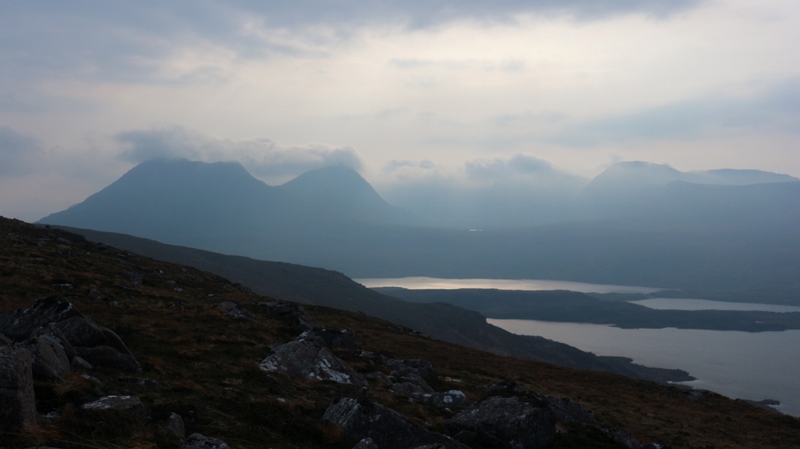 And when those views include An Teallach,,Suilvan and Cóigich..well, whats not to like. Anyway, once on the lane that headed for the coastal path I was expecting all the difficulties were behind and I could look forward to easy ground for the remainder of the day...I was in error. The lane was lovely and I really enjoyed the couple of kilometres or so until after a parking area I joined the "Posties Path" I had never heard of this path but an excellent info board informed me that in the 1860's this route was used by a local man to deliver a postal service twice a week. 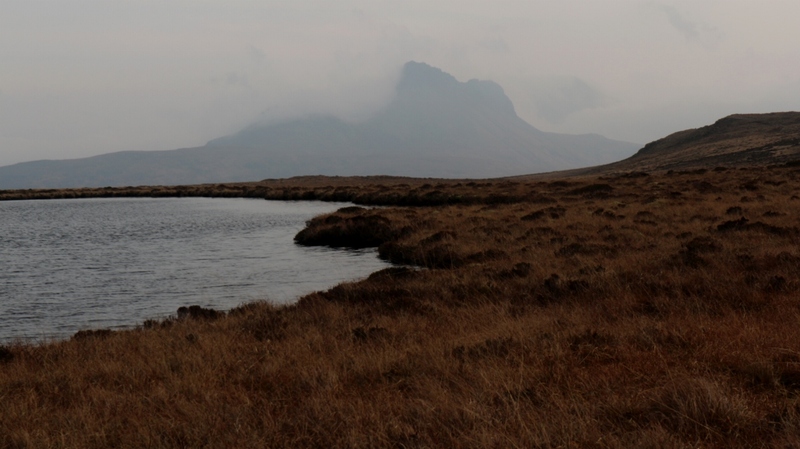 Initially the trail is well defined as it makes it's way across the bog towards the bay and Dún Canna. Before you reach the water my route turned right and a steep 100 metre climb followed by a rising traverse of nearly another 100 metres saw you rise into wild rough ground high above the sea. 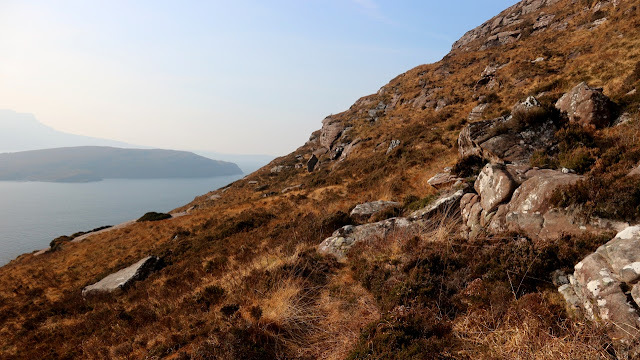 There are many twists and turns, some steep sections and exposed sections and there is much to keep the mind engaged besides the stunning views all about. 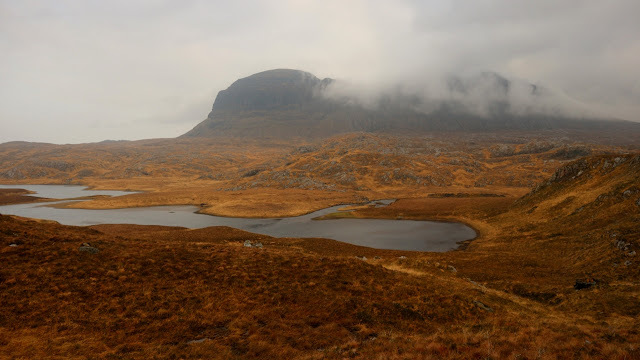 After a couple of kilometres the trail drops to about 50 metres above the sea and in places you find yourself using heather for holds as you cross sloping slabby rock and on a wet weather day it could prove a bit treacherous. Sometimes the route is difficult to keep track of and when I spotted a cairn on a rock outcrop above the sea I descended towards that. As it turned out it wasn't on the trail but instead marked I guess a viewing point but it was a gorgeous spot so I decided to have lunch there. Being by the sea is always something of a novelty for me and I was enjoying myself immensely. Here the breeze was quite stiff but what a place to let the legs dangle over the edge, eat my sandwich and revel in my surroundings. And what surroundings they were. 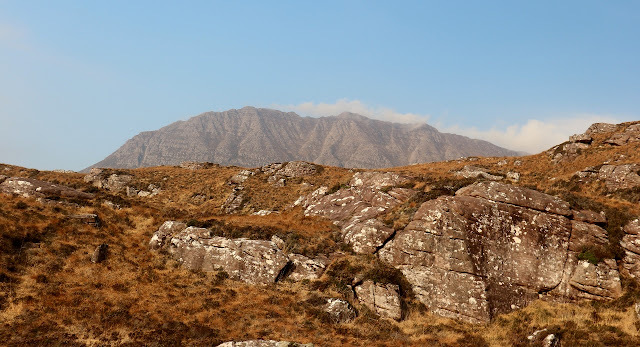 The sea was blue, the land was wild and soaring above it all was Ben More Coigich which rose to nearly 750 metres and presented a wall of promising looking rock towards the sea. Mind you it wasn't exactly balmy, and as I had a fair old way to go yet I didn't delay too long before setting off again. Ahead lay what looked like the steepest, most exposed section of the trail and I was wondering just what was to come. 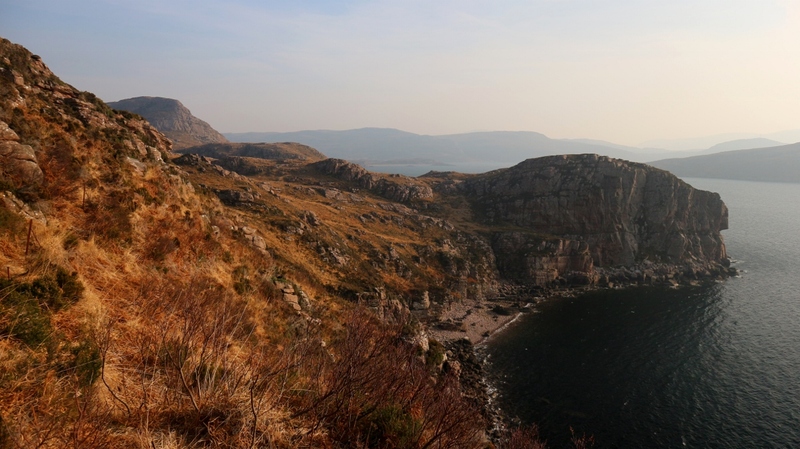 I climbed up about thirty or so metres until I crossed a trail and I followed this around to a stony bay. 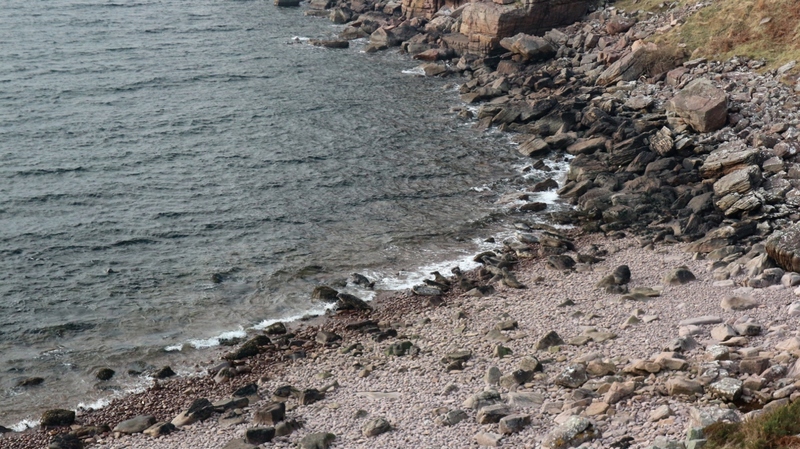 Here I was delighted to see quite a few seals on the shore but they weren't long retreating into the water as I neared. I had dropped right down to the shore so another steep climb followed until the trail started to level off. Now, suddenly the trail became a well constructed track and provided safe and straightforward passage across the exposed section. 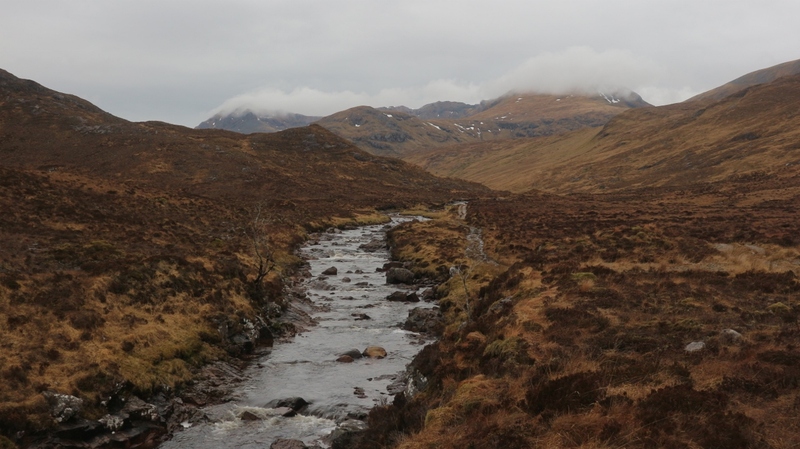 Soon I was beyond any difficulties and after crossing a small river in a narrow rocky cleft (I believe this is difficult during rain) I was on more open ground at Culnacraig. http://acheninverhostel.com/ was beautifully situated over a footbridge, by a stream with views out to sea. 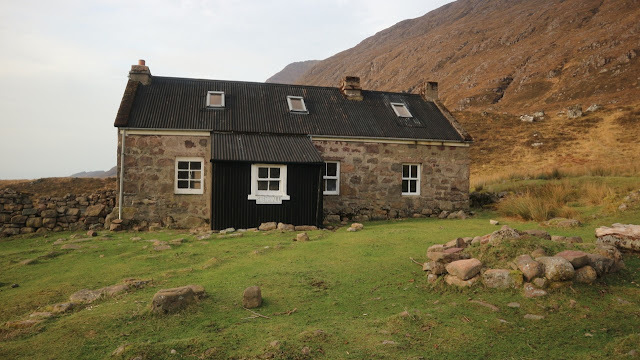 It was an old crofters cottage (once owned by the SYHA) and was packed full of charm and character with great facilities. I settled in and enjoyed the warmth and facilities and whiled the evening away. I met Ruth later on and was delighted to discover she was originally from Cork. 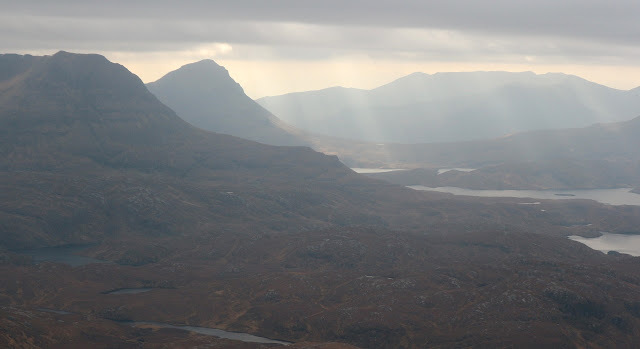 This morning I was leaving the coast and heading for Stac Pollaidh and later a rendezvous with Patrick Price. 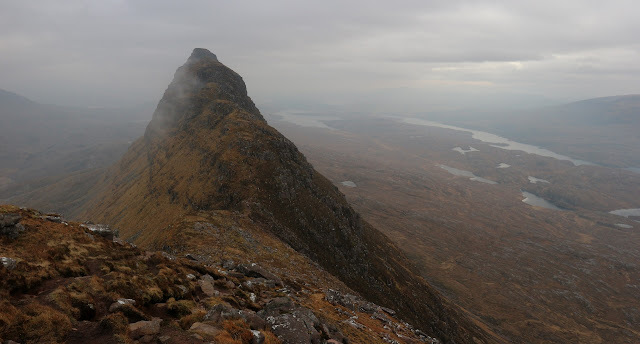 I was looking forward to today for many reasons but one was it would great to get up close and personal with one of the most iconic peaks in the UK and two it would be superb to spend some time again with Patrick. 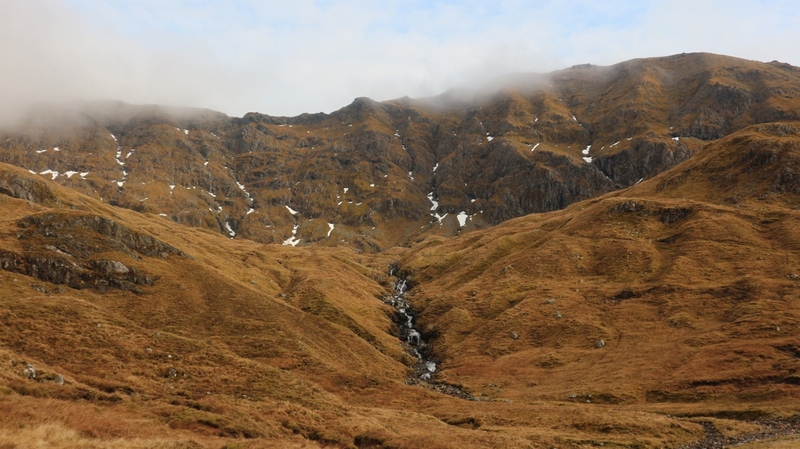 First up though was the long drag up to the crest of the shoulder of Ben More Coigaich nature reserve. 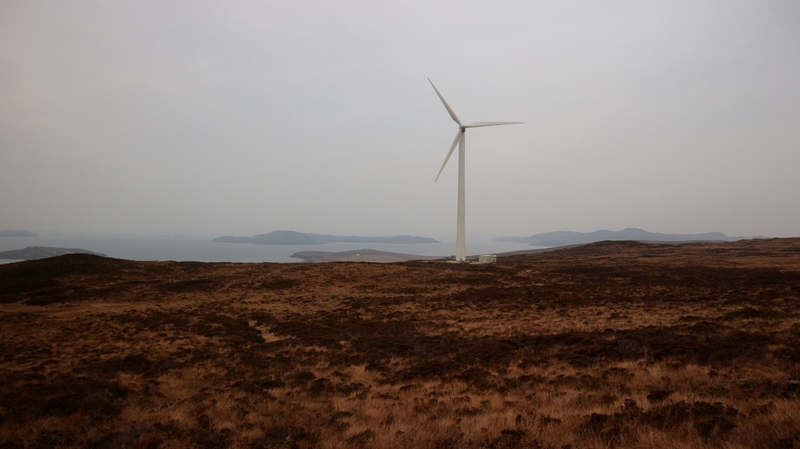 I must say it is something of a surprise to find a large wind turbine hereabouts. I know green energy is the way of the future but in the middle of one of the most beautiful of landscapes is no place for one of these. 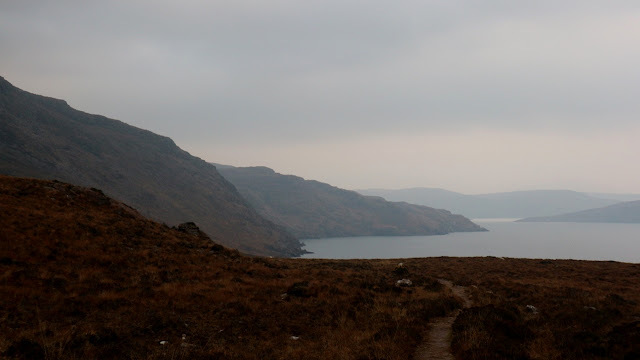 Once I was over the crest it was out of sight and wild rough ground lay ahead. 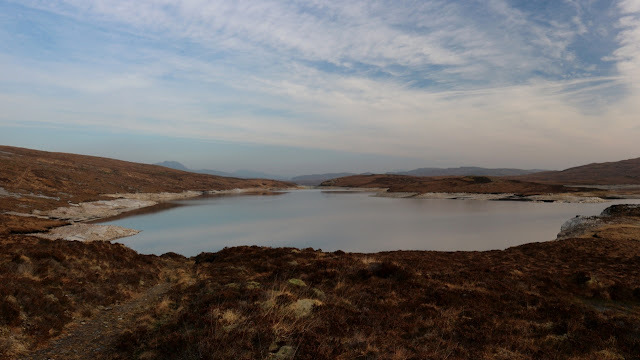 Using small lochs to navigate I eventually dropped down through some birch woods and after crossing some really wet ground I reached the first obstacle of the day the Abhainn Osgaig which connected Loch Bad a'Ghaill to Loch Osgaig. 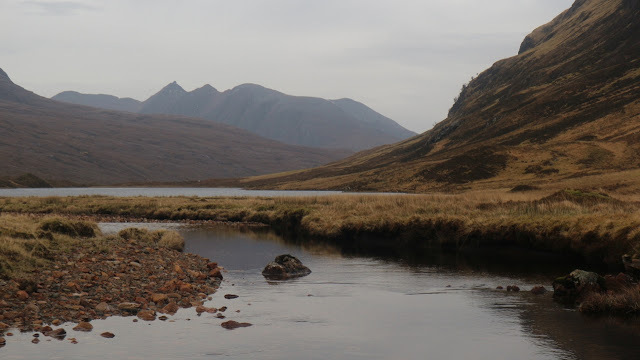 There was nothing in the way of a ford or bridge marked on the map so there was no option but to roll up the trousers, take off my boots and socks and after donning my Crocs I set off across. I had reached the river at a wide section where a few small islands broke the flow. Even though it was wide, it was shallow and on the three sections of water I crossed the water never came above the knees. It didn't stop it from being bloody cold though and after I finally emerged onto the far bank it was a huge relief to dry off and but on my warm socks and boots. 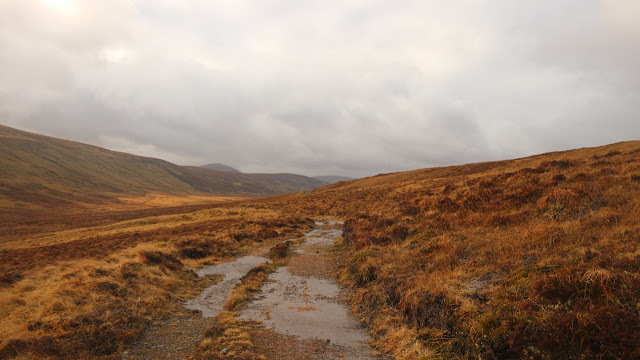 Another short boggy crossing and I reached another road. I turned right and then left and climbed to the point when I reached the crest of the spur coming from Stac Pollaidh. What can you say about Stac Pollaidh ?. 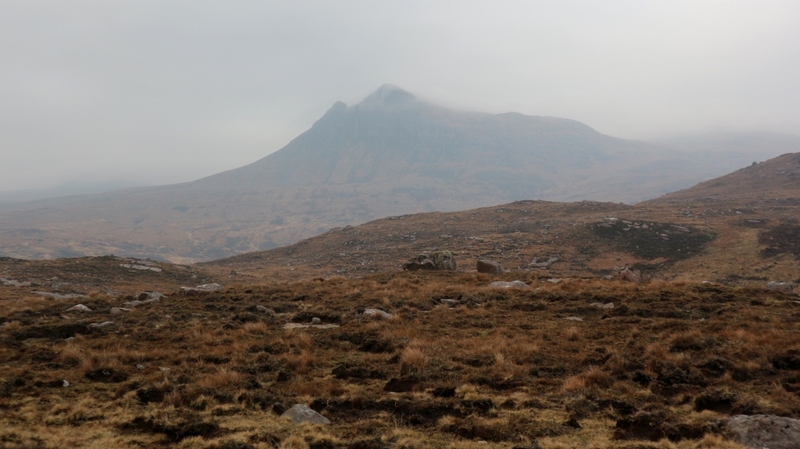 If Ireland had the last refuge of The Jedi (The Skelligs 😏) then Scotland has Mordor 😊. Reaching the modest height of 612 metres it nevertheless presents a fantastical rocky outcrop of Torridonian sandstone and doesn't appear to offer any easy way to the summit. It wasn't the best day for photography being hazy and monochrome but the peak was a constant attraction. 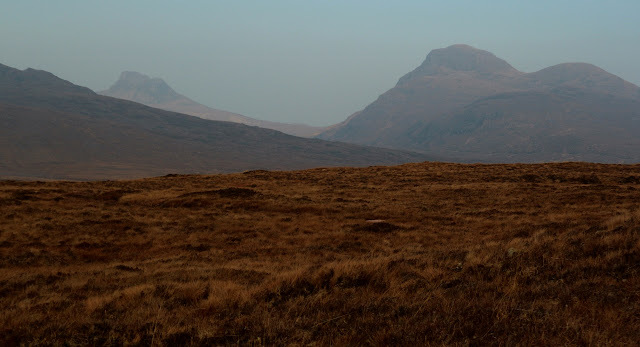 Now as I started up the wide spur it loomed ever larger straight ahead. I reached the end of the easy ground and then had a 150 metre climb to the shoulder. This went well and soon I reached broad flattish area. 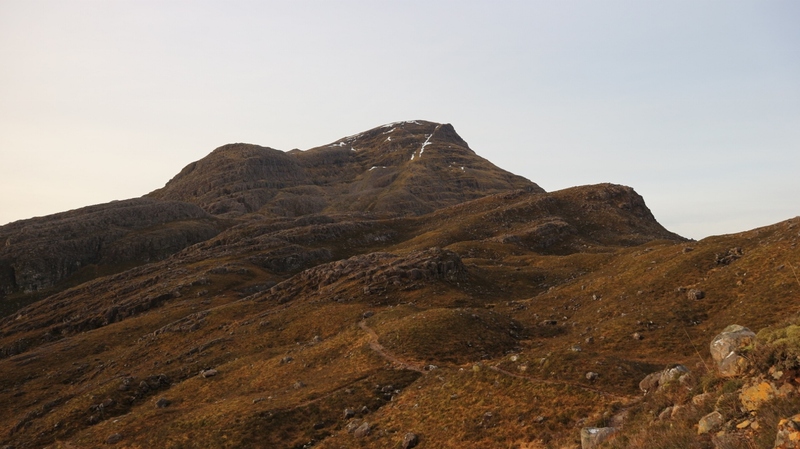 and once there I could see a path that rose steeply up a gully to the summit ridge. I debated dropping the big bag but decided against it and just set off up. 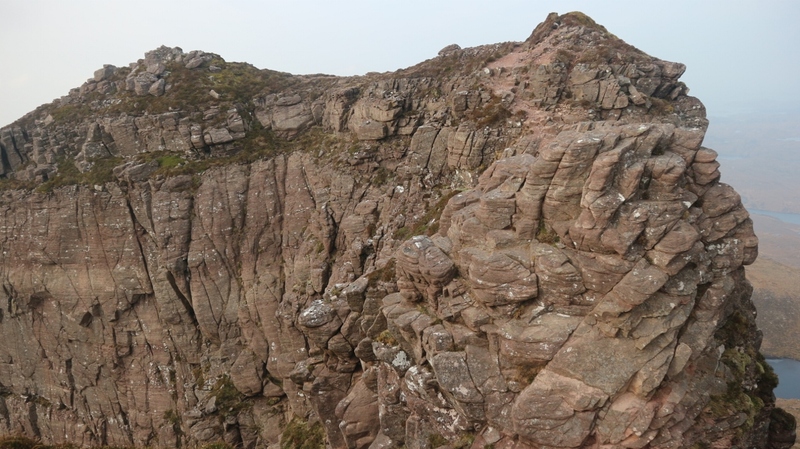 It went surprisingly well and before long I exited the gully and arrived on the ridge. It was clear that there was an awkward step to be negotiated before the true summit could be reached so I dropped the bag and set off. It is only a couple of moves but I was glad to have the weight of the bag removed for them. It was chilly and a wispy cloud threatened to take away the limited views so I didn't delay and returned to my bag and dropped down a different gully back to the shoulder. It was then easy to drop from the shoulder to the glen in the east. 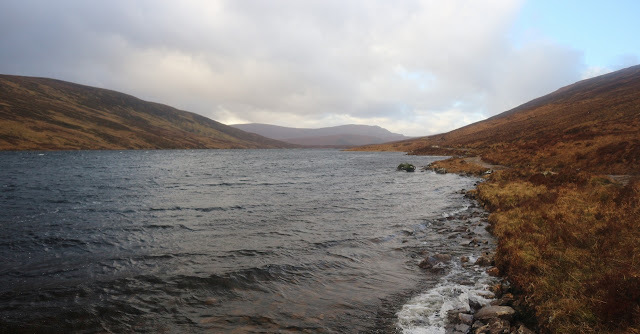 I enjoyed a bite of lunch and set off for Loch an Doire Dubh and hopefully a rendezvous with Patrick. We had first climbed together six years before in Torridon and it had been a great success. Three years ago we met again and that time I was struggling with a knee injury and climbing poorly but it had been great to see him. This time we had great plans to get some quality winter climbing done but the weather had other ideas. 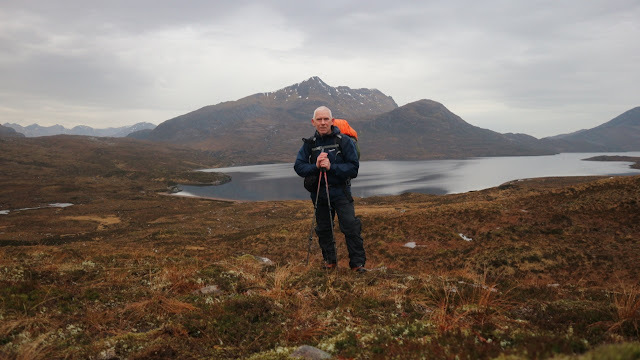 I had resigned myself to solo hiking so it was wonderful, surreal and quite humbling to discover that he was willing to drive the width of the country to spend an evening together. I dropped down to near the lake and in the distance I could see a solitary figure making his way towards me. We greeted as old friends and set off to the campsite at the lakes end. 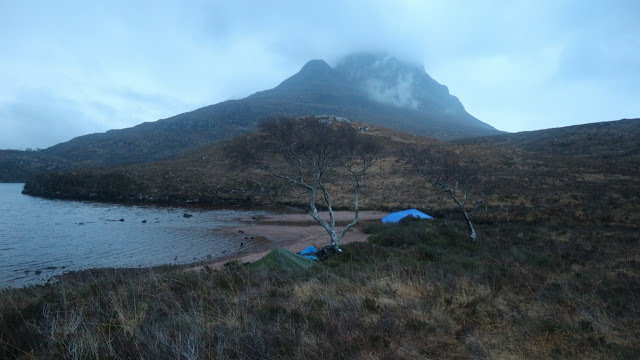 He was after canoeing the length of Loch Sionasgaig and into Loch an Doire Dubh and set up camp on a little beach at the southern end. We chatted, caught up, made plans, ate and drank well into darkness and beyond. He had brought some beer and cooked some venison and generally pampered me. I was spoilt. An insidious cold crept into me though and eventually I retired to bed. I slept very well. After breakfast the time came for farewells and I set off once again on my little odyssey. 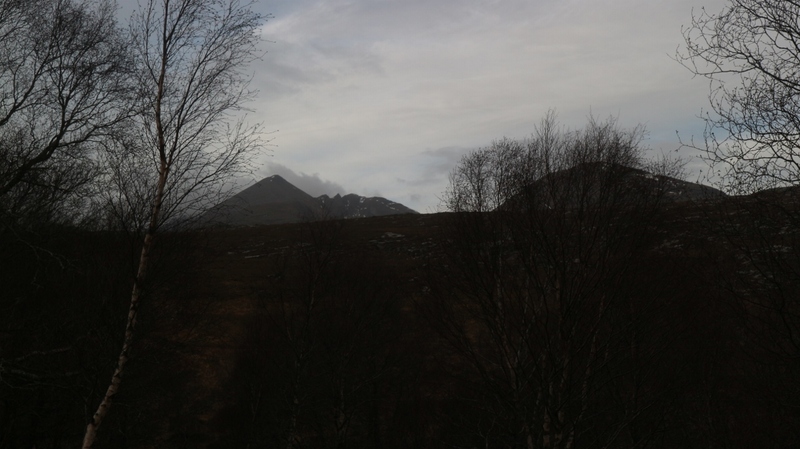 Some cloud clung to the mountain tops. And what mountains they were. 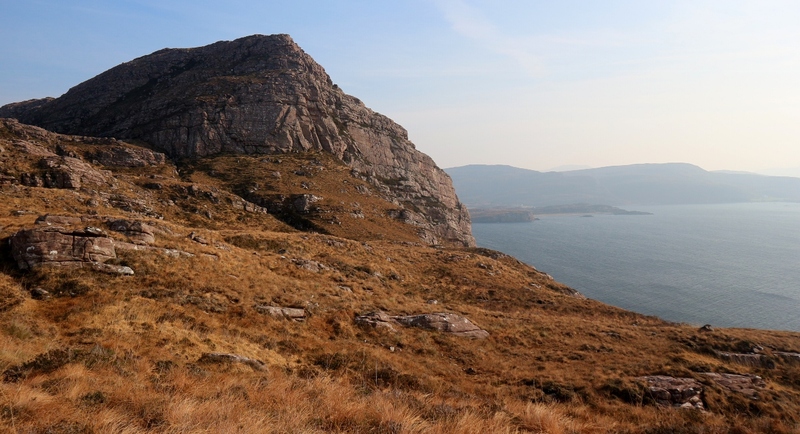 Cúl Mór and Cúl Beag rose fortress like from the waters edge and each one would make for a good day out but it was my next peak, Suilvan which I was looking forward to the most. I felt uplifted by last evening and I was really looking forward to today. The crossing of the river between the lakes was a blessedly easy affair and then there followed a rough undulating crossing on rough ground to reach the bay at Sionasgaig. Patrick had suggested a possibility of meeting me here but there was no sign of him on the lake so I guess he was relaxing and enjoying the comforts of the campsite a while longer. 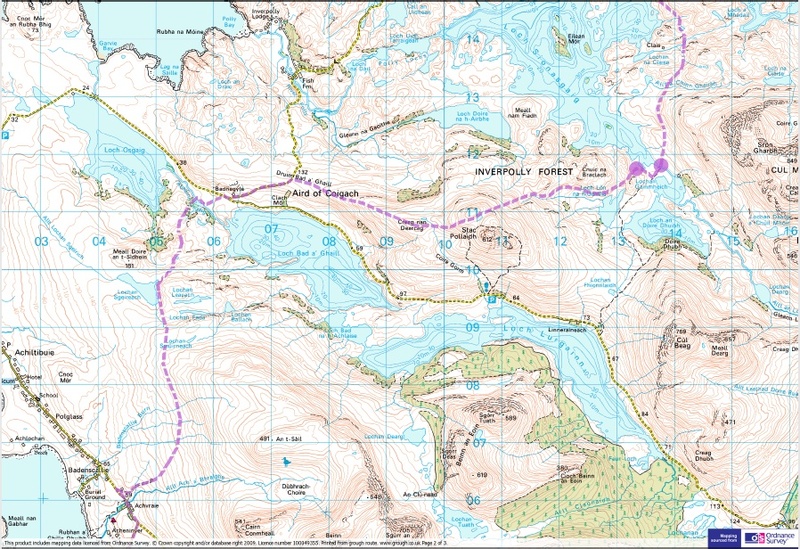 There are some fine spots to camp hereabouts and it would make a natural stopping point in the route. 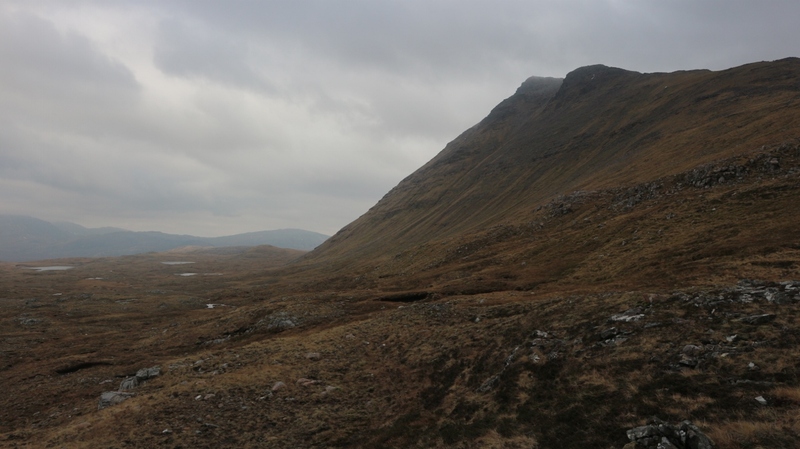 Next up came a short climb to the rough pass that led on towards Gleannan a' Mhadaidh,under Suilvan. The next river, Uidh Feárna looked pretty big on the map and it was clear as soon as I saw it that it would be another boots off job. It wasn't too bad today after the dry weather but I suspect it would be a real challenge in spate. 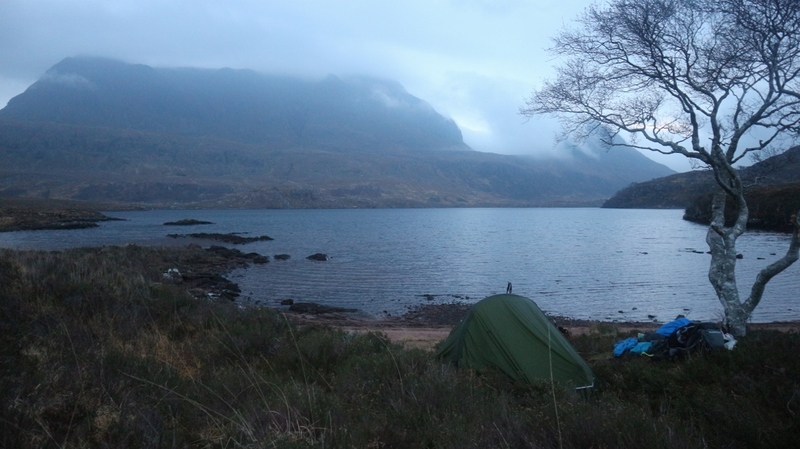 Again there are some superb camping spots here. 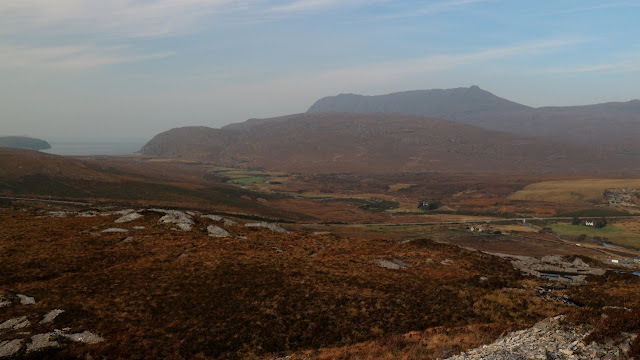 After mostly pathless ground yesterday and so far today it was nice to join a trail that rose steadily towards Bealach Mór in the middle of the formidable flanks of Suilvan. From a distance the route looks very steep but as you near it things lay back considerably, but it is still a stiff climb. Slow and steady does the job and I eventually reached the pass. I dropped my bag here and set off immediately for the summit. It felt soooo easy without the load and I swiftly progressed towards the top. A good path and the odd little scrambly bit kept it entertaining and I was soon on the top. To make things even better the cloud had lifted and I had views. And what views. 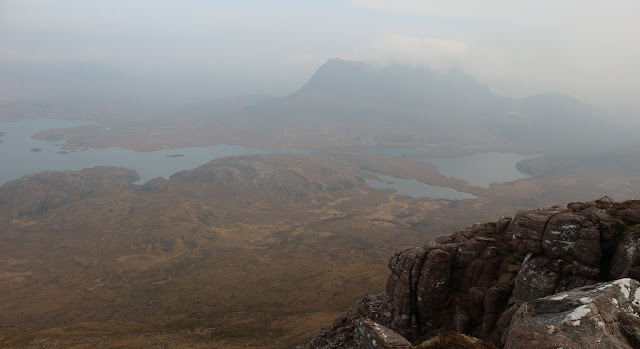 To the southwest Stac Pollaidh, Cúl Mór and others formed an almost otherworldly scene. 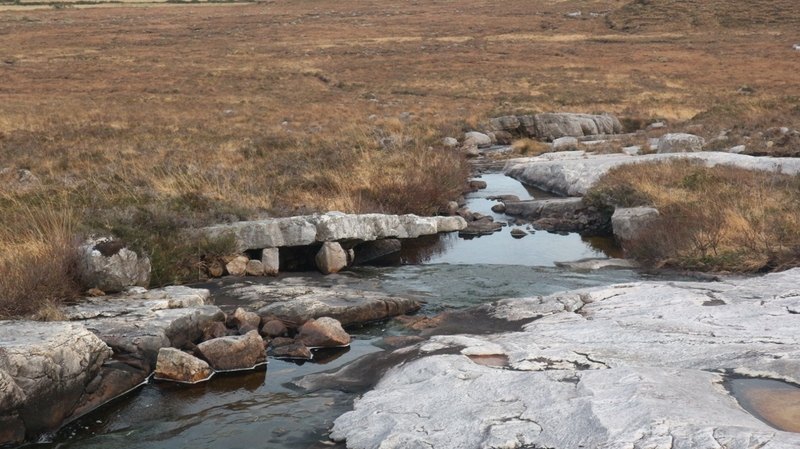 Wild waters and bog stretched away to the sea to the west and north. 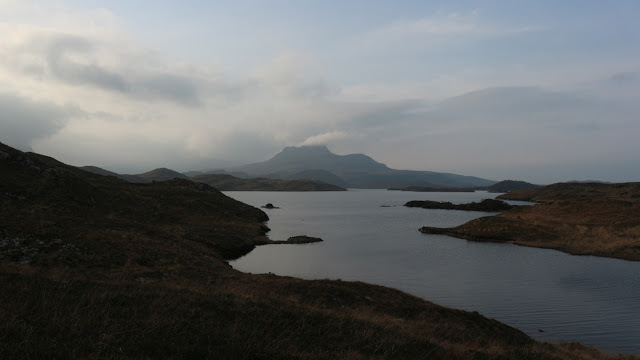 Quinag and more stood to the north and northeast and nearby Canisp stood between me and Inchnadamph. 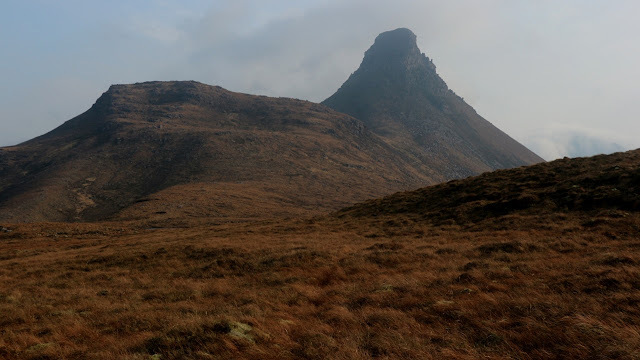 But all this was eclipsed by the sheer "wow factor" of the view back along the ridge to the other summit of the mountain Meall Meadhonach. 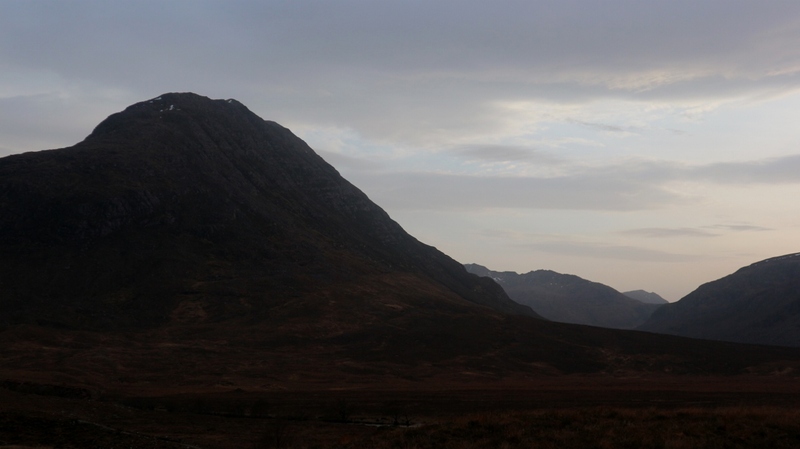 This is the view that rightly makes this mountain so famous. Of modest height it may be but the elegant sculpted lines of the summit ridge are a joy to behold and I felt privileged to be able to be here. As I returned to the bag I spotted a small white bird land on a rock a ways below me and I didn't immediately place what it was until I heard it grouse. The poor Ptarmigan must be wondering what has happened to all the white stuff. 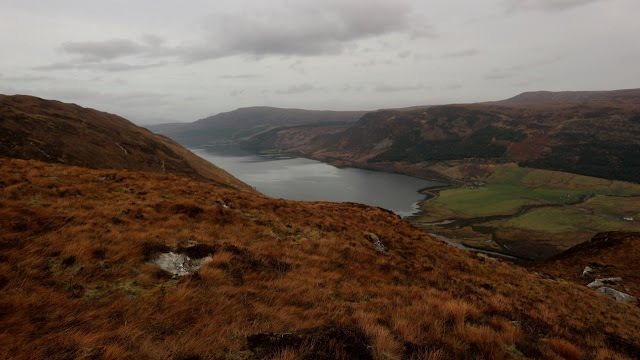 A better path descends to the valley before Canisp and once down I joined a rough estate track as it crossed the river and climbed up the hillside on the far side of Loch na Gainimh. This made progress up to the shoulder of Canisp at the 500 metre contour a little easier and once I reached here I enjoyed a well deserved bite to eat. 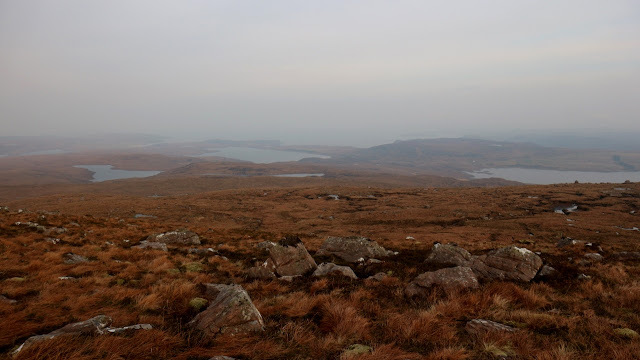 I briefly toyed with the idea of dropping the bag and climbing the 300 metres to the summit but sense prevailed and after lunch I traversed around the mountain's northern flanks on pretty good ground, passing Loch na Faoileige before finally reaching the descent at Meallan Liath Beag. Now I could finally see Inchnadamph below and the end of this leg of the journey beckoned. It is an easy, if slightly longer than it looks descent and before too long I reached the river that runs along the valley. I had hoped to see something like a footbridge or stepping stones but there were none. Thankfully it was running quite low and I made it across dry without having to take off the boots. A short walk up the road and I reached the carpark by the hotel (closed) and I turned and followed the road east for about 500 metres until I was well beyond the few houses. Here I found a good spot for my tent above the river. I wasted no time setting up my home and whiled away a pleasant evening. I did discover a couple of ticks crawling around in the tent and I was careful to look for more thereafter but found none. Some heavy rain arrived after dark and I enjoyed the sound of it pattering my tent as I drifted off to sleep. 8.5 hours and 1300 metres of ascent over about 24 kilometres. The rain had cleared by the morning and I emerged into a very pleasant day. 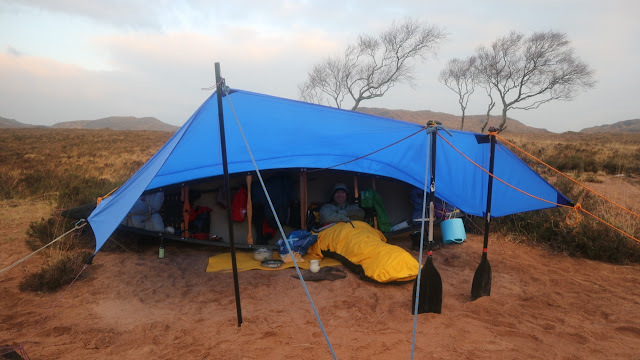 My sleeping mat had sprung a slow leak in the night and I had spent a less than completely comfortable night. I'm at a loss as to what to do with these mats. Whenever I opt for the lightweight blow up option I always seem to end up on the ground regardless of how careful I am 😕. Anyway to better things. It was a clear dry bright morning which was a bonus as the weather was set to deteriorate throughout the day. I packed up and was on the move at 08.10. 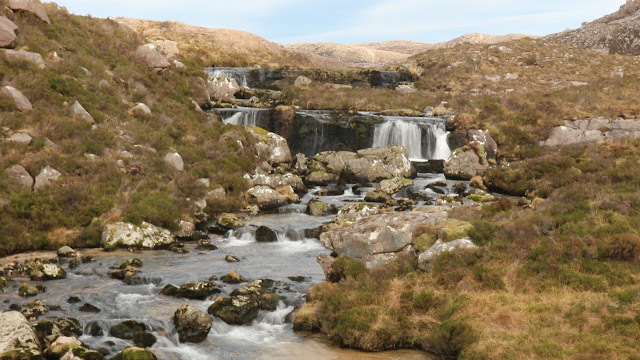 It is easy walking into Gleann Dubh and height is gained gradually on a good track that runs alongside the river. One notable aside is that the rock here is limestone and the river actually disappears underground in places. 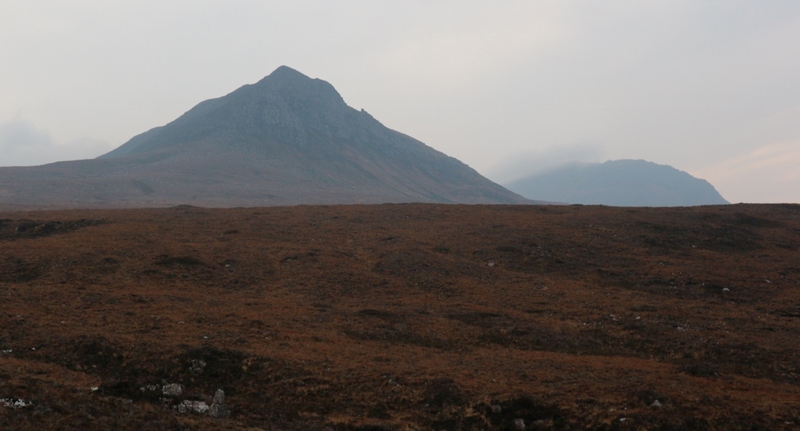 Clouds clung to the summit of Ben More Assynth and it looked a formidable beastie as I entered further into the glen. 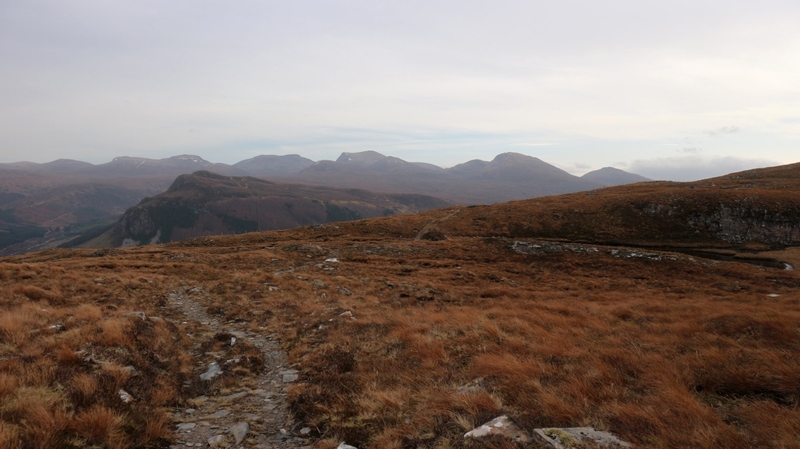 Eventually the trail diverged from the summit path and I climbed up across the open bog towards the narrow gap ahead..Am Bealach, which was at around 550 metres. I rejoined a faint trail that rose above a rocky section on the left and then the pass narrows nicely and things have a nice wild feel. An osprey gliding by as I exited the pass was a lovely bonus. The weather was picking up if anything and as I traversed the ground down to the eastern side of Glen Oykel the summits that radiated from Ben More made a spectacular sight. 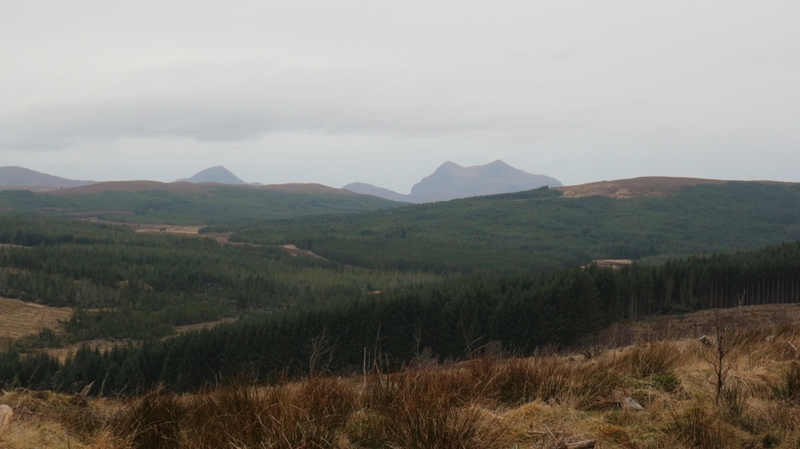 I could see the glen stretch away into the distance and as this leg was over 30 kilometres I still had a long way to go. A long traverse under the crags of Cambridge a Mheadair was tiring as in places it went across gully after gully but there was never any real difficulties. After five kilometres I finally reached the river and a good track made for easier going. Just as I reached here the first of the rain started and it stayed raining as varying degrees of severity for the next few hours. I reached Loch Aylsham with its lodge and staff houses and at the end there was a diversion sign for the trail with the instruction to follow the blue markers. It sent me onto a higher forest road which dropped down to near the river after five further kilometres. Mind you, of the blue markers there was no sign. Back by the river the walk continued pleasantly until I could see a roadway rising on the other side of the valley. I didn't have the map for this short section of trail but I was hopeful that I was nearly there. 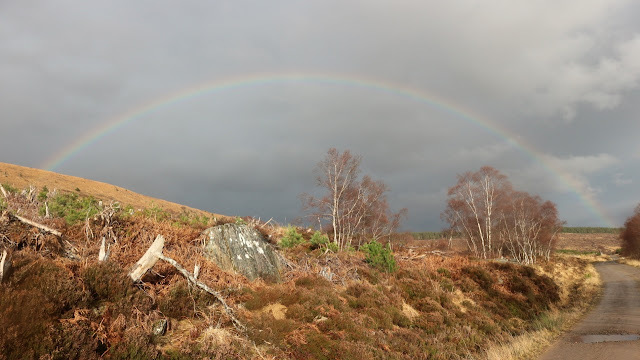 The rain stopped and some glorious rainbows appeared and the trail continued on for a fair while. I was hoping that the hotel might be open but once again things were all closed up when I got there. I continued on down the lane, past the row of little houses and once I reached the bridge the crosses the river Einig I decided to camp in the adjacent field. It stayed dry until I had fed myself and then the wind started to pick up and rain returned in earnest. I didn't mind though as I was pleased with the days effort and settled and dry for the night...that mat was a bummer tho😣. 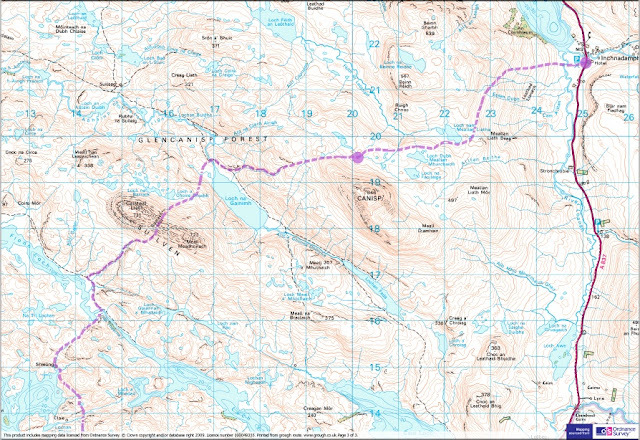 32 kilometres 550 metres ascent in 8.25 hours. 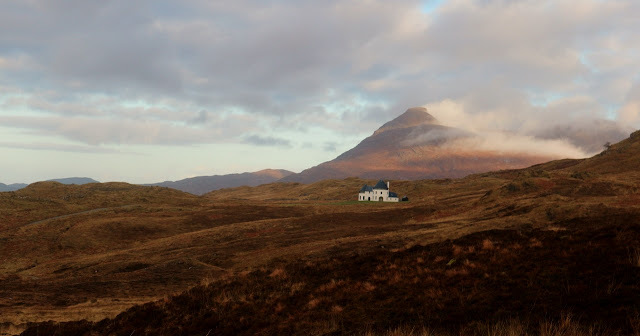 Today I hoped to reach Ullapool. To be honest I wasn't certain of bus times to Inverness on Sundays so I decided to err on the side of caution and make an early start. I woke up at 06.15 and set about breakfast and packing straight away. Well that's not strictly true as it took ages to reach a sitting position such was the pain in my lower back after the rather uncomfortable night (I had given it a turn about a week before the trip). Once I loosened out it was okay and I managed quite well. The heavy rain had stopped for now and I was able to complete my packing in the dry and I was on the move at 07.10. The nearby river was a good two feet higher this morning and I hoped that I wouldn't have any problems at river crossings today. It didn't stay dry for long and I hadn't gone two hundred metres before the first squall hit. 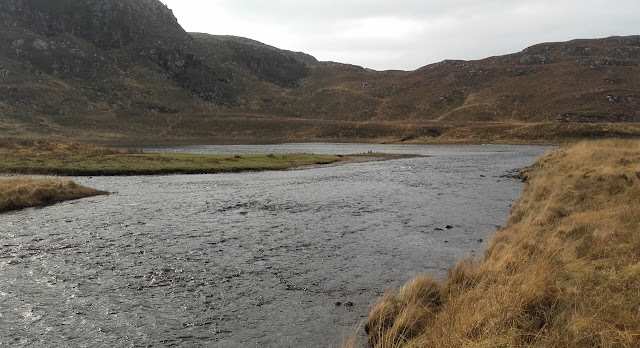 Once I left the relatively sheltered position of my campsite the fury of the wind matched the fury of the rivers and it promised to be a bracing day. Not that I could complain as to hike in Scotland (on indeed Ireland) at this time of year and not encounter bad weather would be the stuff of fantasy and I had had it pretty great up to now. I had the full "Berghaus Packlite" raingear on and I was nice insulated from the weather. 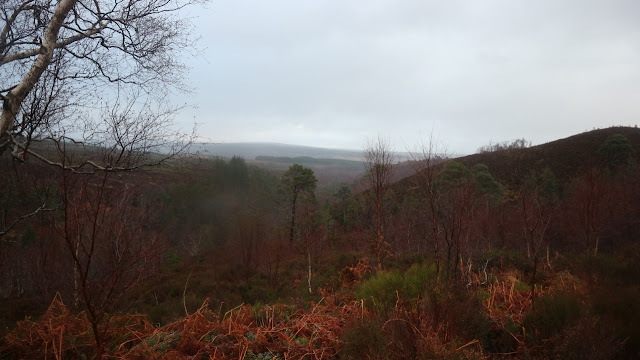 Initially things weren't too bad as I was reasonably sheltered by the forest but once I entered open ground it was at times difficult to just keep walking into the worst of the gales, it was great 😊. 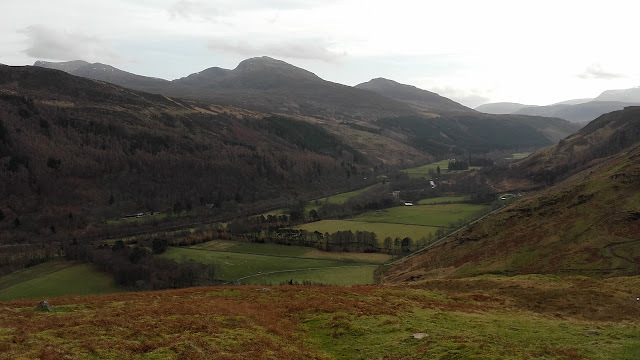 Today's route didn't have anything in the way of big climbs and indeed no big mountains framed the views but it was all the more interesting for that. Low sweeping moorland tops stretched seemingly endlessly as far as I could see and this openness and expansiveness, coupled with the weather today, made it feel wild and wonderful. 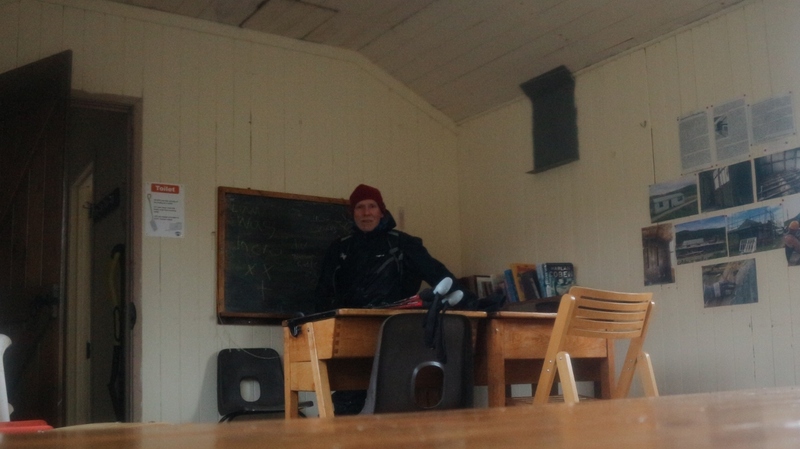 After 6 kilometres I reached the delightful "Schoolhouse Bothy". This bright, airy, quaint and clean bothy looked wonderful and provided a brief shelter from the weather. I was in no doubt it would make a great place to stop for a night. 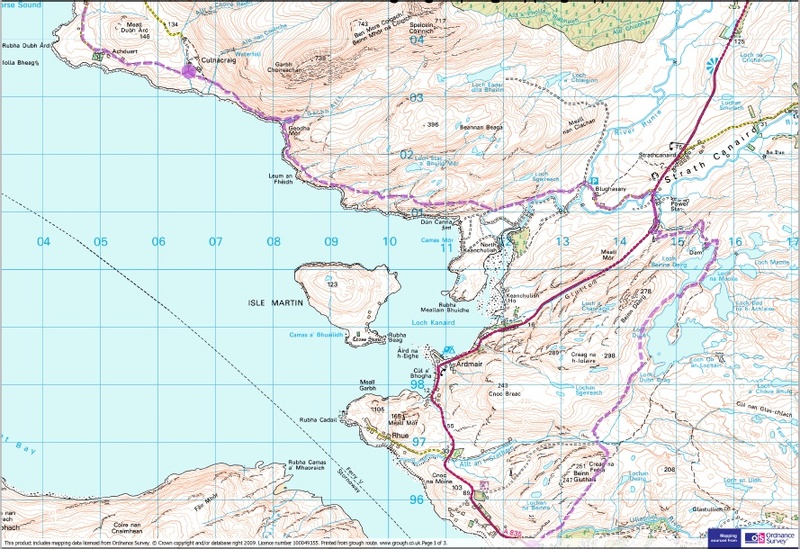 I had given the map another perusal and saw that that only possibly difficult river crossing that was on the route was the river Abhainn Poiblith which flowed from the substantial lake Loch an Daimh. With the weather like it was I just hoped it wouldn't provide an impassable obstruction. 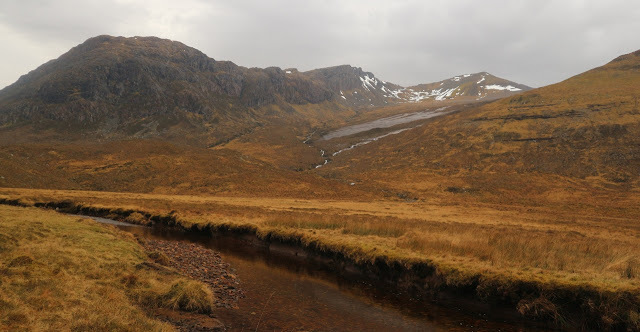 The trail continued on a rough estate track and after crossing a few minor streams I reached a shallow glen that promised to hold a more substantial body of water. When I reached it it wasn't too bad, being about twenty or twenty five feet wide but clearly over two feet deep. I debated taking off the boots etc but it seemed like too much hassle and I had hopes that with the gaiters and rain pants covering the boots I might have a chance of staying dry for the few steps across...Well you don't have to be a rocket scientist to work out that that didn't happen and I sploshed out the far side thoroughly soaked. Ah well..live and learn..or perhaps not..doh. 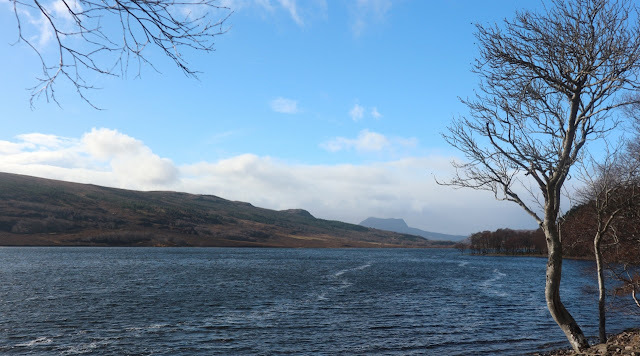 On the plus side the weather was starting to show some signs of improvement and patches of blue sky appeared and the squalls became less frequent. 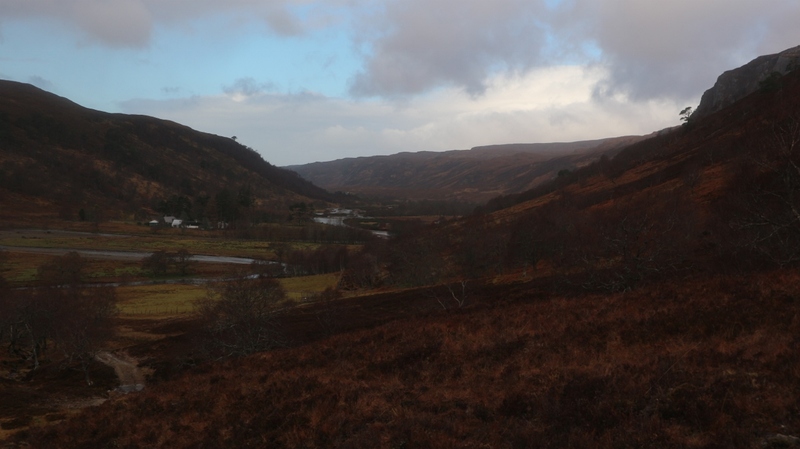 The track climbed gently up from the river and headed further up the glen. 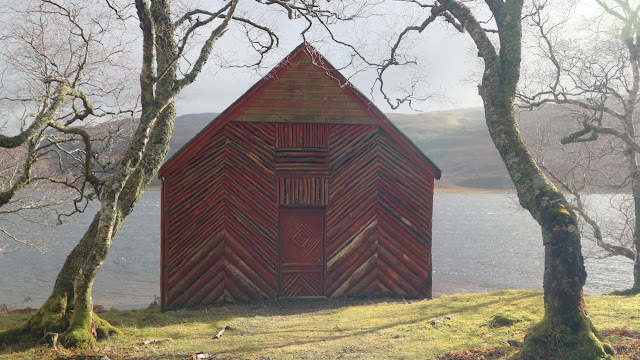 Now I know I said that I had looked at the map in the bothy, and I did, but it wasn't until I spotted the large lake ahead that it finally dawned on me that the river I had just crossed was the one I had been worried about and I was filled with a sense of relief. I was also a bit cross with myself as, if I had realised, I would have taken the time to remove my footwear and my tootsies would now be nice and dry. 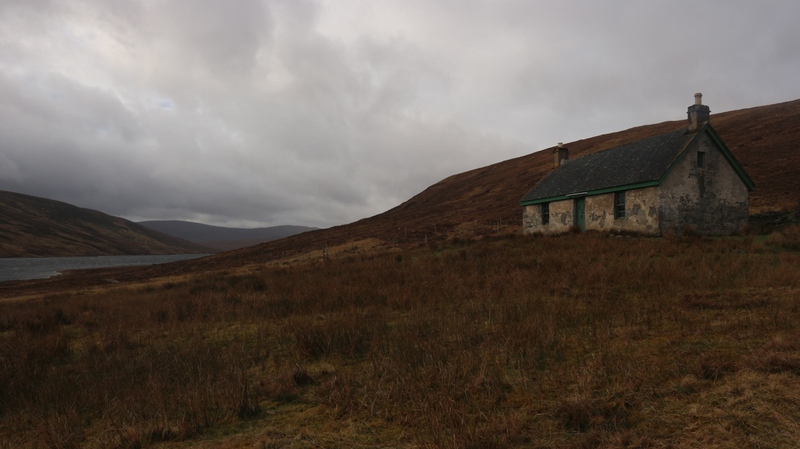 Next up came another bothy overlooking the end/start of the lake at Knockdamh. This was a more traditional bothy and looked to be in very good condition as well. What a wonderful resource these bothys are and a huge thank you is deserved to everybody involved in their maintenance and upkeep. I had a bite to eat here and even stripped off the rain gear as it was blue skies outside. I had the rain gear back on before I left at another blast of horizontal rain arrived..it was that kind of day. Another gradual climb and I reached the point where the trails diverged. Mine continued straight on to the west while the one for Inverael headed south and looked to be entering wilder, more hilly country. Shortly thereafter I dropped down to a wide valley where some estate buildings were. 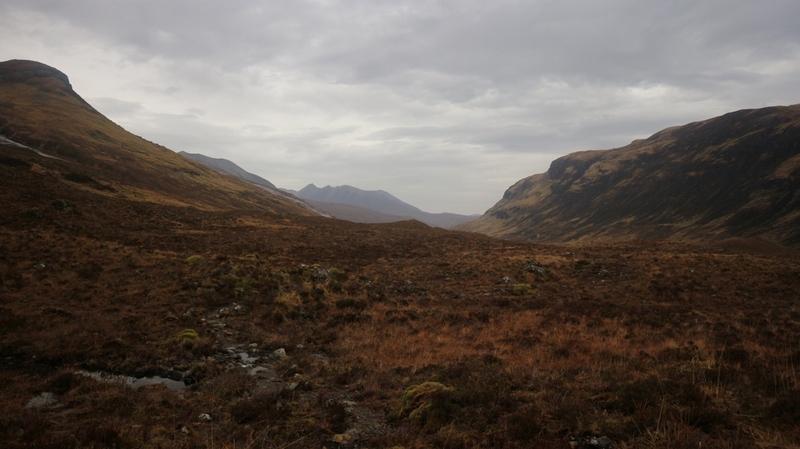 This valley was serviced by a good track and progress from here was gentle and civilised. 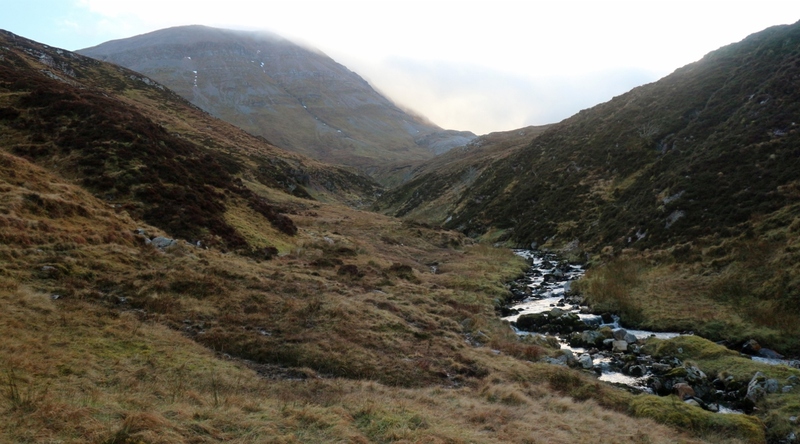 Above on the right a long series of cliffs looked to offer a multitude of rock climbs and the substantial Rhiddoroch river was a constant companion on my left. This was sheep farming country and lots of them dotted the rough pastures all around. 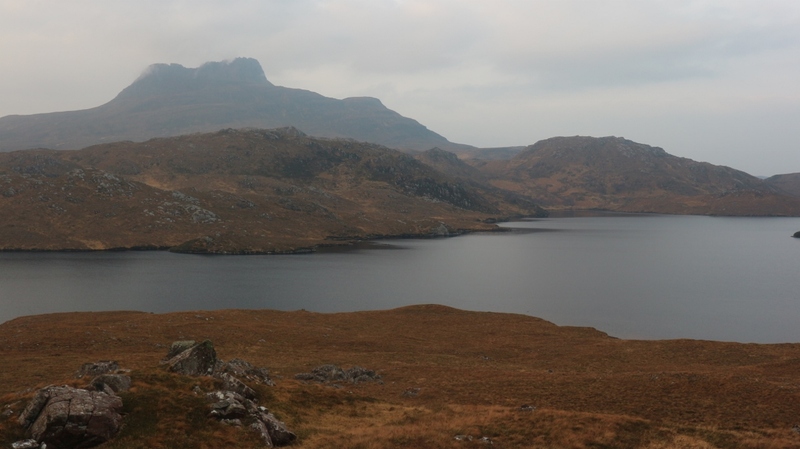 It was a long valley and it took a fair while to reach Loch Achall that was overlooked by Rhidderoch House. The track became a tarred lane that clung to the lakes edge right to its end. The suggested trail sticks to the lake shore and is supposed to cross the river via a bridge, but that is no longer in existence so a rough trail follows the river until it again reaches the road. 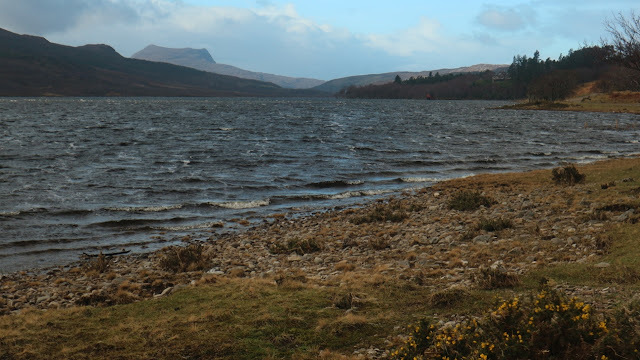 This crosses the river and after several kilometres takes you down to Ullapool. 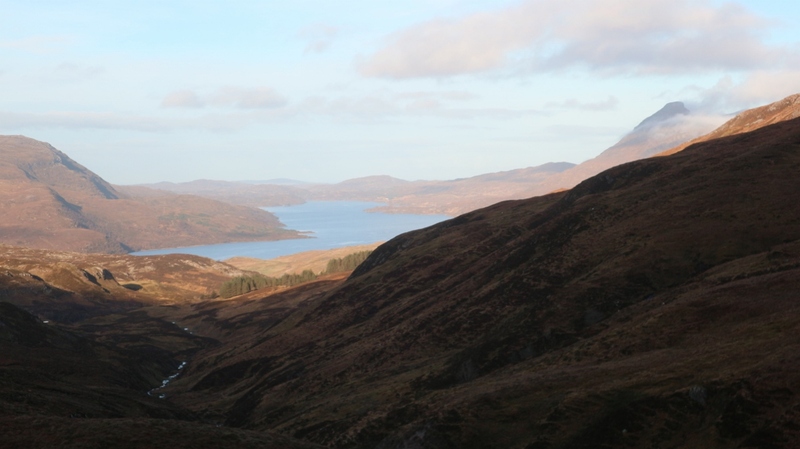 It was wonderful to see a White Tailed Sea Eagle soar on the hills near the end of the lake. What a sight this bird is with its huge barn door wings. A wonderful bonus to see it so near the end. 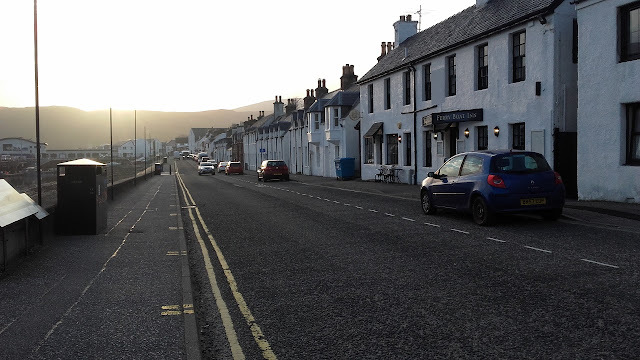 So I entered Ullapool just as the rain recommenced and made my way down to the ferry terminal. I arrived at 14.45 and discovered that the bus departed at 17.20. I also booked myself onto the sleeper train that night so I was all set for the long journey home. 32 kilometres..400 metres ascent and 7.5 hours..a fitting finale to the trip. To say I was tired as I travelled home would be an understatement and to be honest it took a day or two to feel human after I got back. I had packed in a fair old bit over the nine days and had covered not far off 230 kilometres..well over 6000 metres had been climbed and a fair bit of it on trackless rough ground. Wild, wonderful and exciting are just a few of the adjectives I could use but none would capture what I feel about hiking in Scotland. It is definitely true to say that it has the edge on continental Europe for me..at least until I next stand on the Gr 10 or some other Gr and glory at the wonders there...but I did really enjoy this trip. 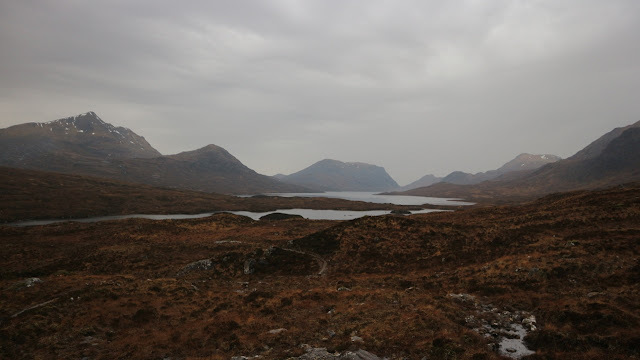 Like last years account, I was delighted to read the second instalment of you Cape Wrath trail adventure as well as the extra circuit to Sulivan. I look forward to the final instalament! Great read, inspirational - thanks! I came here from UKClimbing. Cheers guys. Feedback is much appreciated. So much to do in Scotland. It's a long way to go but definitely worth the effort. Hopefully I'll see that lighthouse someday.